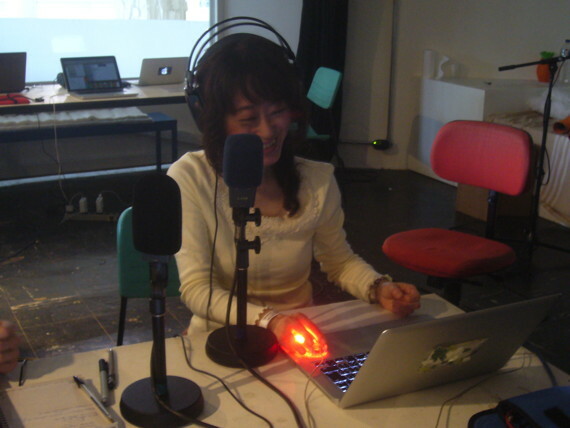 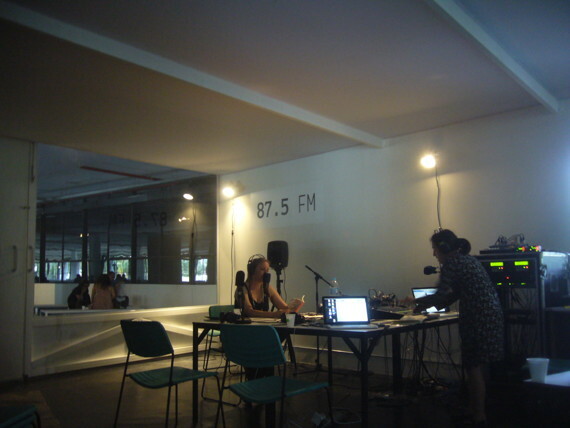 Radio artist Anna Friz took a trip from the US down south to spend a week in residency with us at the Mobile Radio BSP studio. 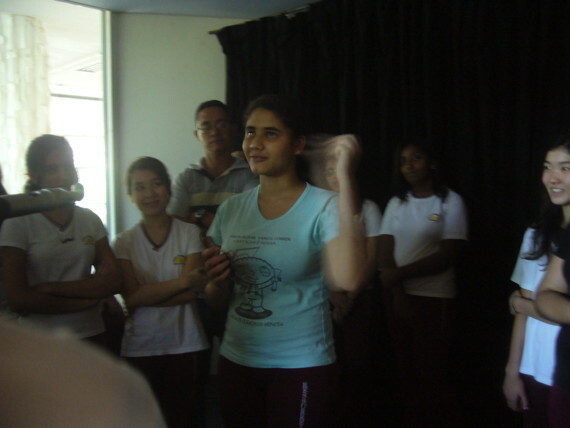 She brought along her own brand of undercover exhibition assessment (listen) and time-keeping method (listen), and her show with Sarah provoked some actionist intervention. 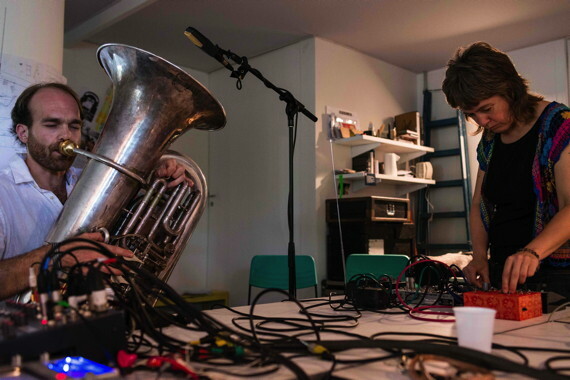 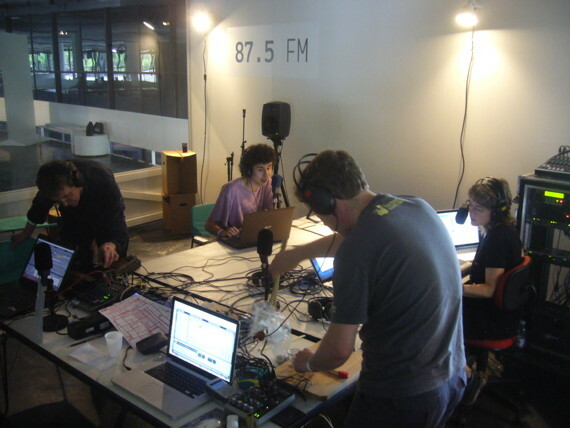 The Octopus Collective’s Glenn Boulter & John Hall from Barrow-in-Furness managed to bring their elaborate take on Cumbrian news aggregation to our radio (listen / listen). 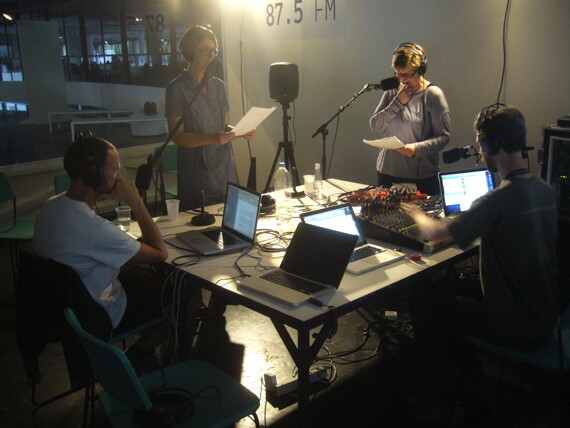 Everybody in the studio had to take part in reading the news, and children were forced to sing songs about horses. 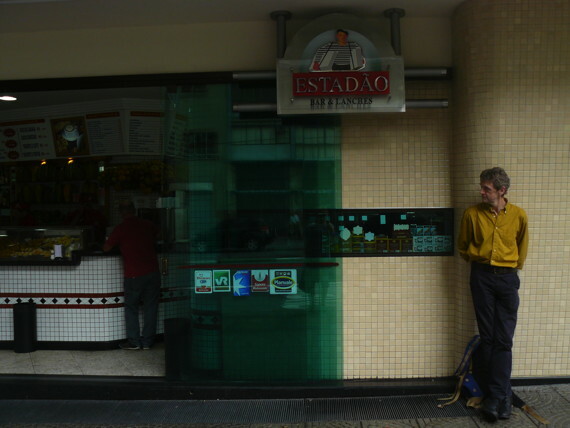 What the Barrowites took home was an addiction to Estadão pork sandwiches. 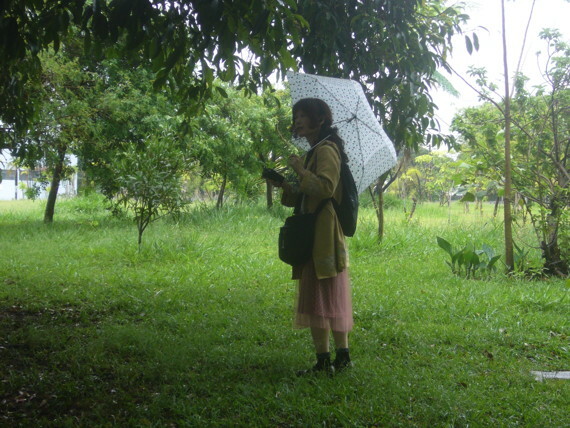 Our next residency guest had by far the longest journey – half way around the globe – to join us for a week: Haco from Japan. 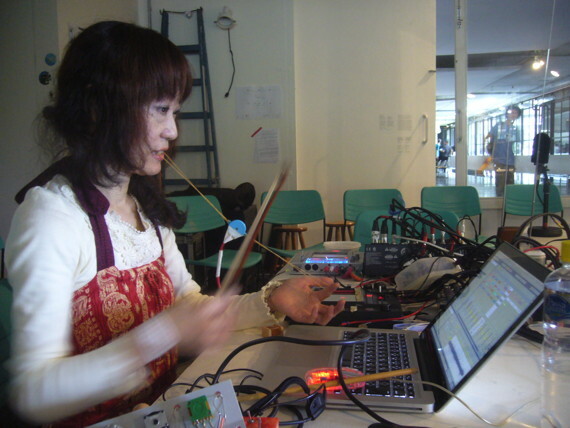 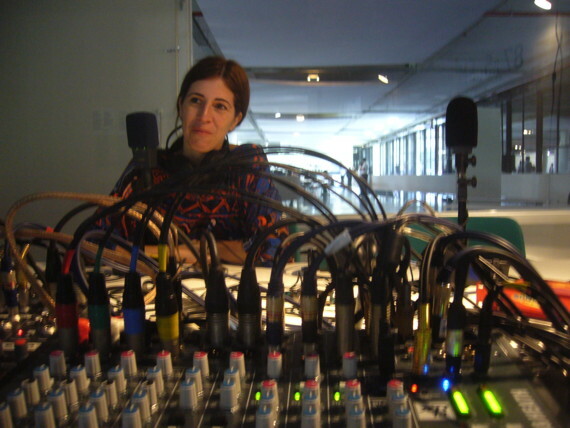 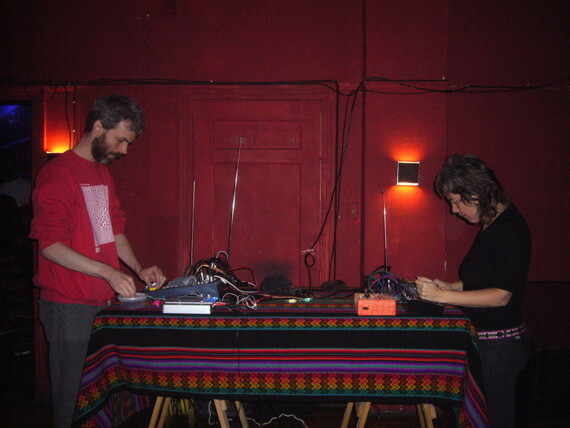 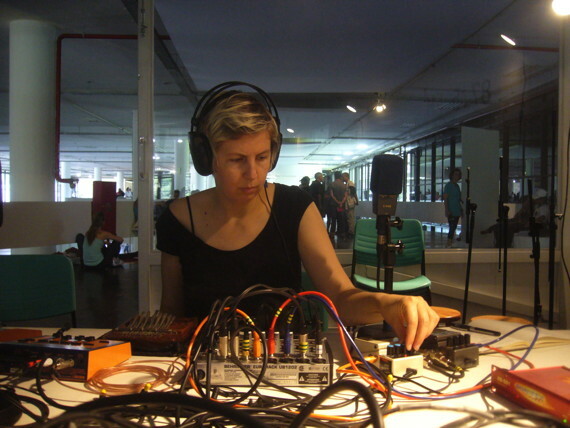 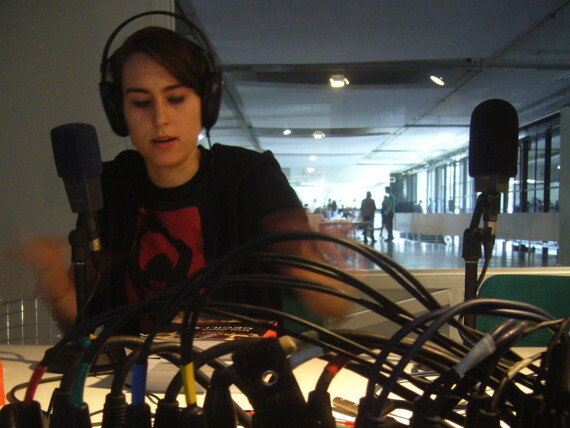 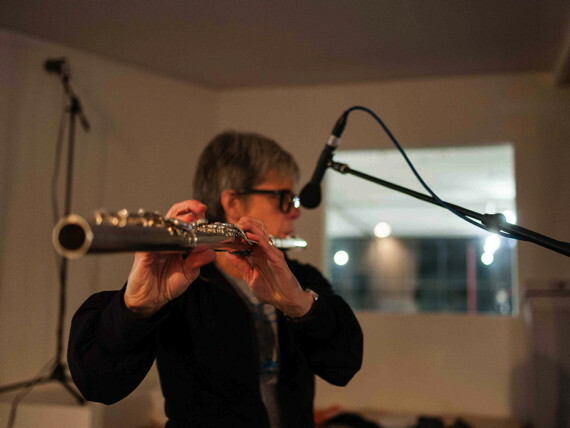 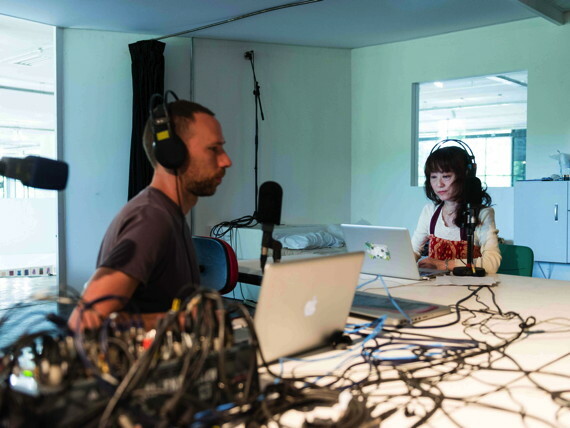 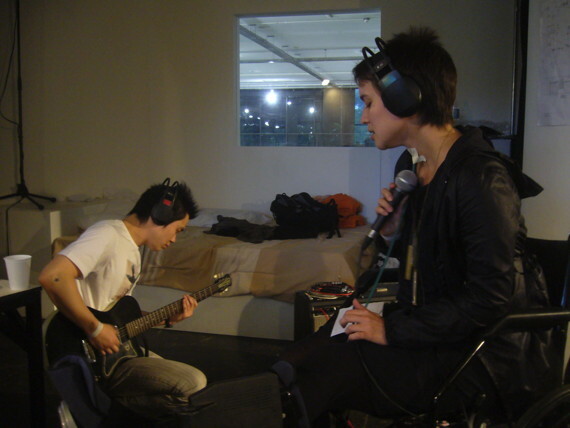 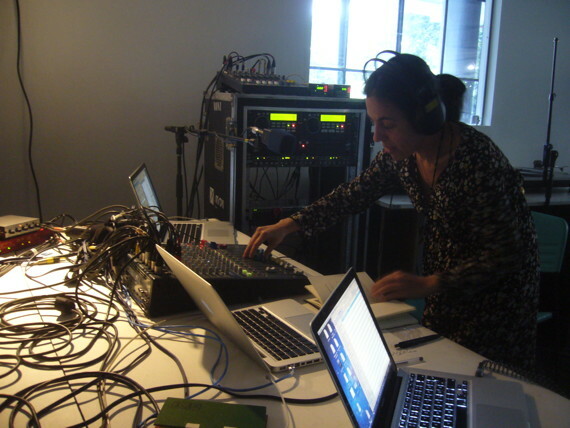 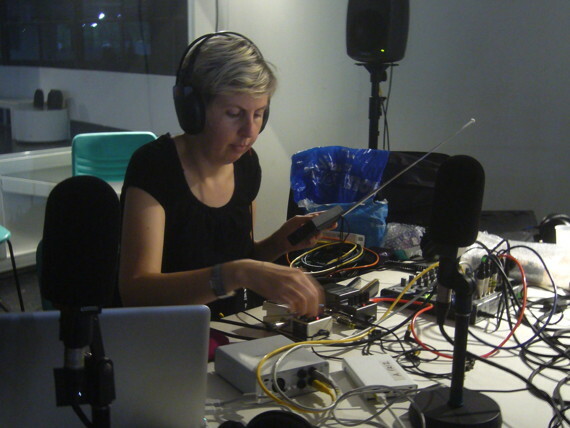 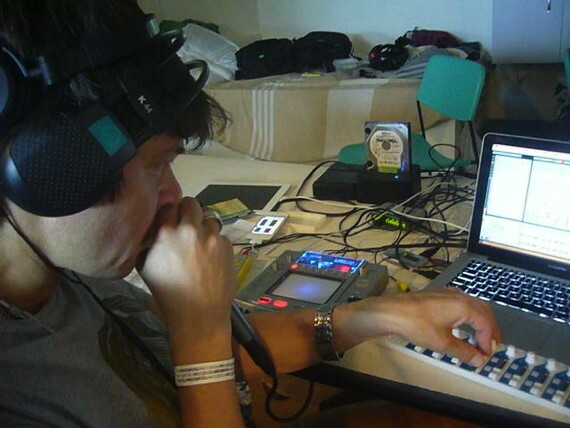 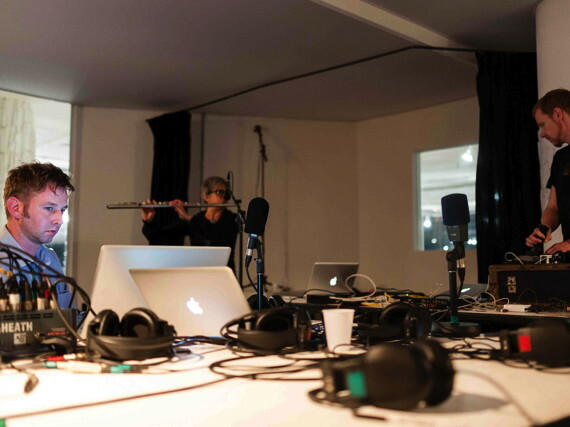 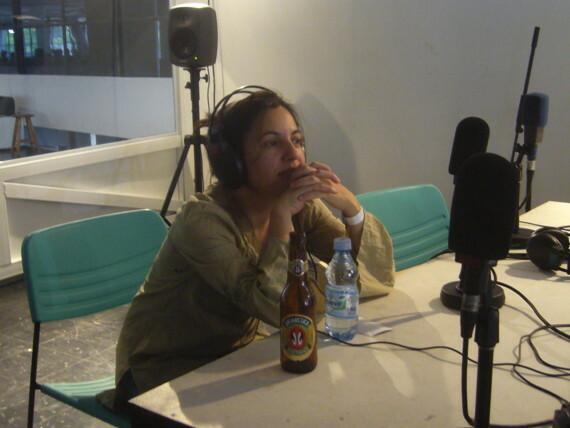 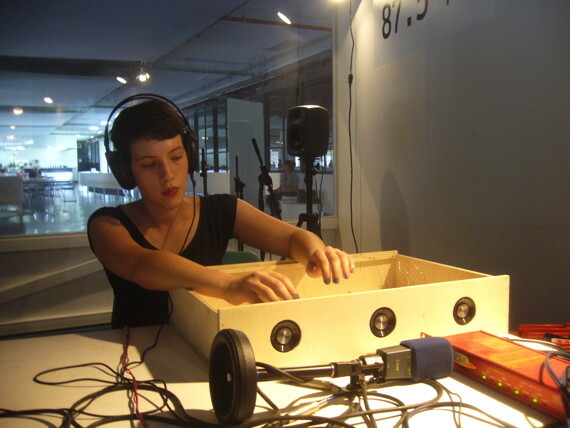 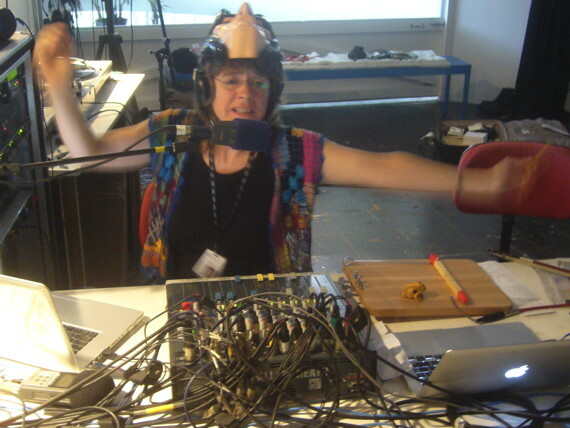 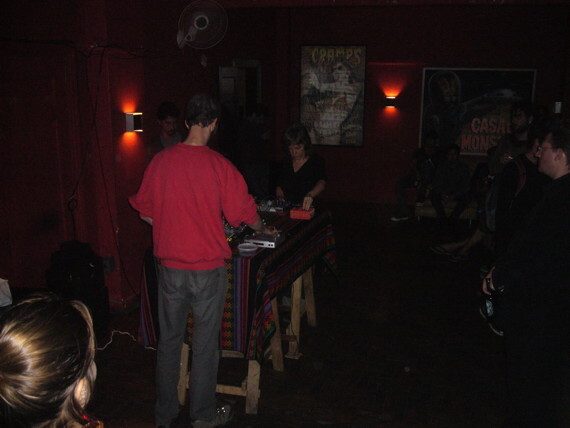 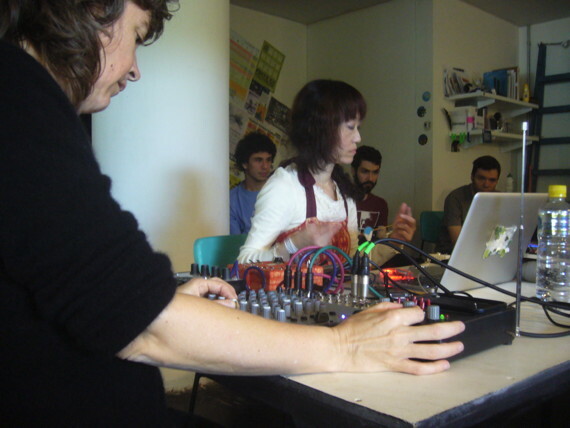 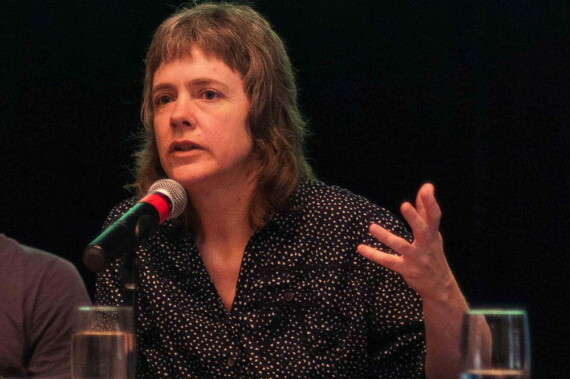 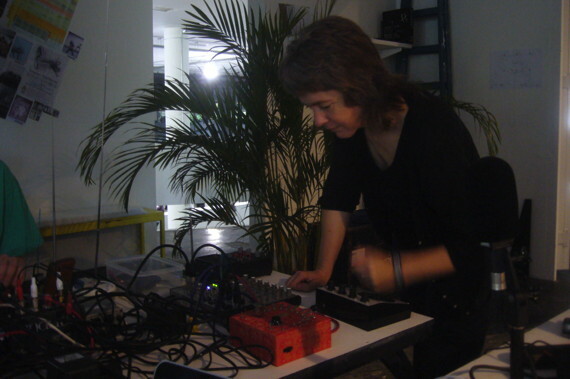 She used field recordings that she gathered around São Paulo to construct a song (listen) explaining her method of working live on air as the piece developed. 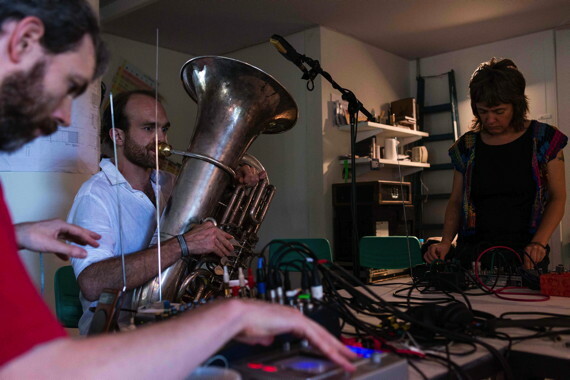 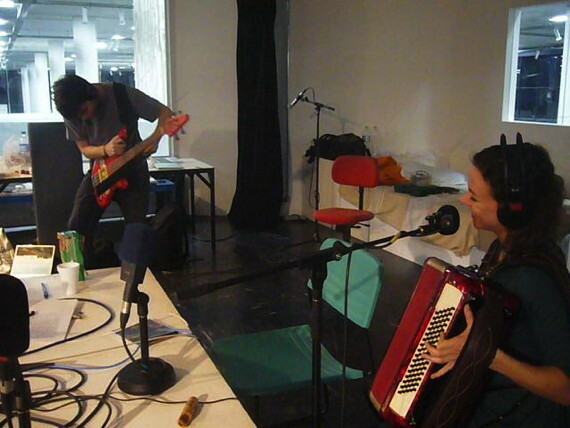 We also used the chance to perform a trio with her under the already existing moniker Mobile Radio Band. 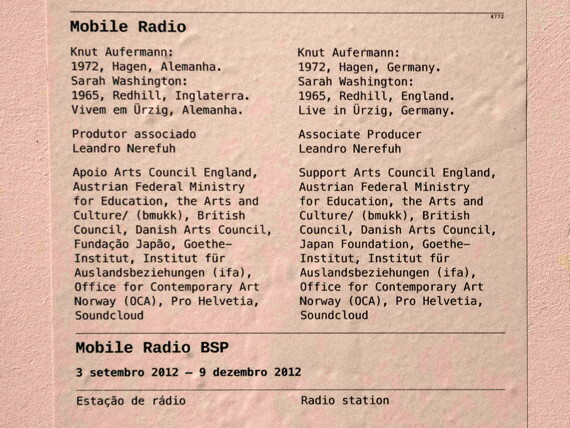 The string of daily visitors from near and far continued throughout the 14-week life span of Mobile Radio BSP. 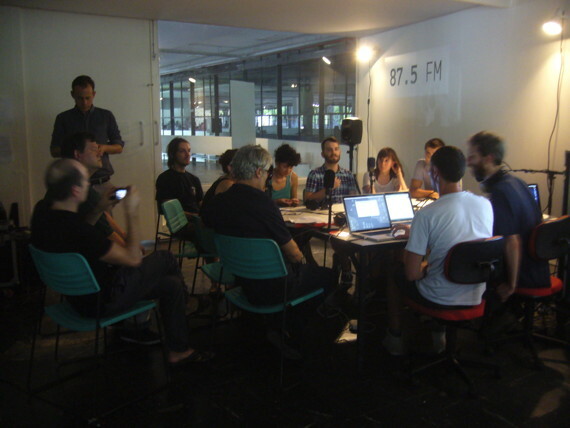 Pictured below are Theresia Louise & Carlos Ulmo, Akin Deckard (listen), OuUnPo (Claudia Squitieri, André Cepeda, Samon Takahashi) & Claudia Cardinale, Daniel Scandurra & Gregorio Gananian, Ciudad Abierta, Voodoohop, Marion Velasco, Lenora De Barros & Artur Lescher and Radia’s Ricardo Reis who was luckily in town on other business. 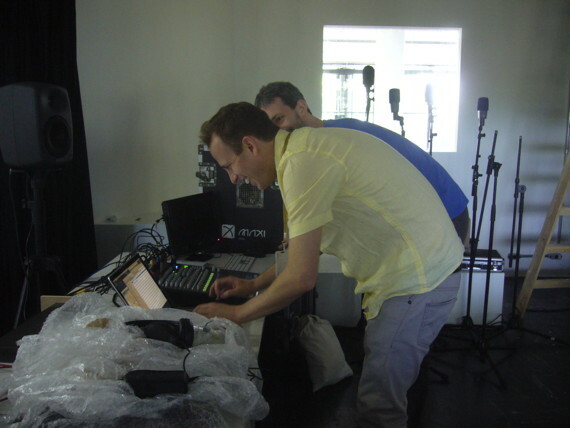 To go to the final part of our Mobile Radio BSP documentation click here. 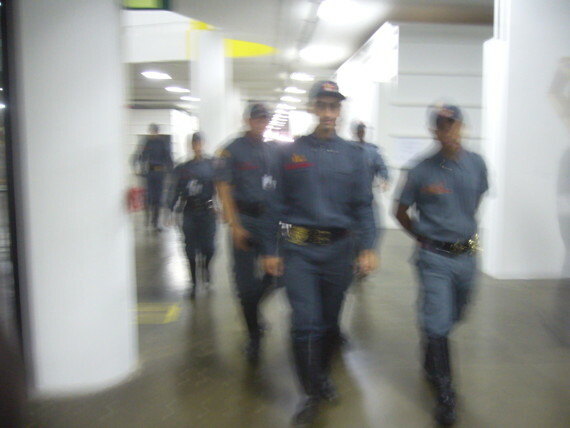 On the 2nd of October 2012 Mobile Radio BSP transmitted an all day broadcast called 24 horas 111 in commemoration of the Carandiru prison massacre that happened 20 years ago to the day. 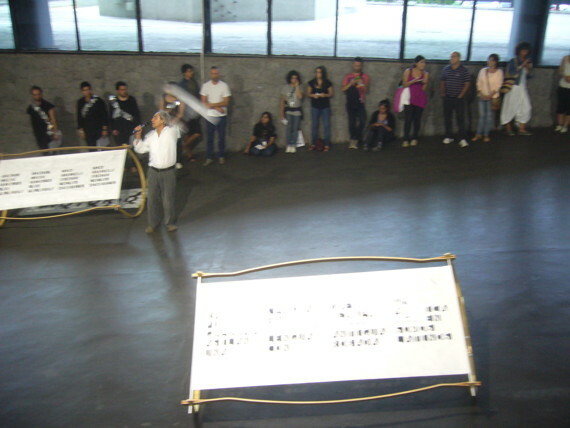 Proposed by Brazilian artist Nuno Ramos and coordinated by Ester Fér it consisted of a 24-hour recitation of the 111 names of the victims of the police shooting at Carandiru. 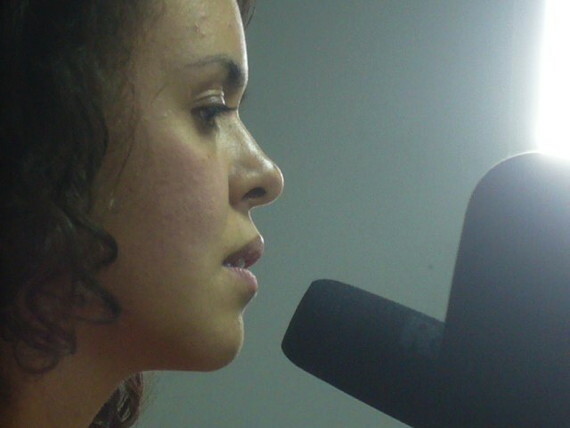 24 speakers read out the list of names for one hour each. 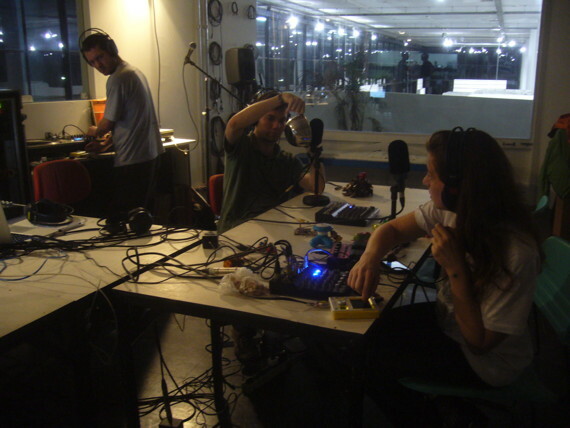 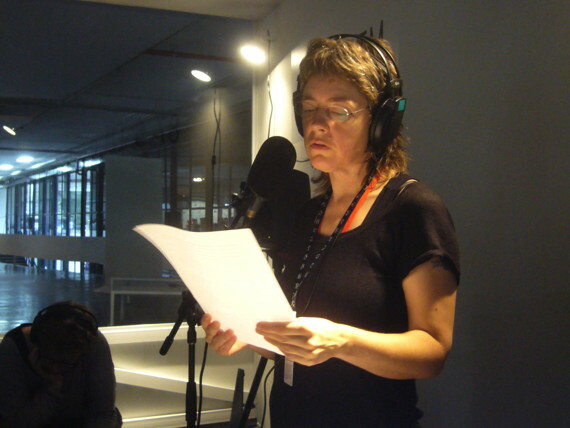 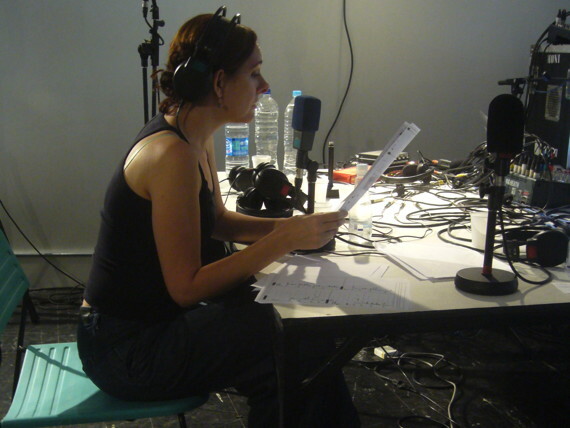 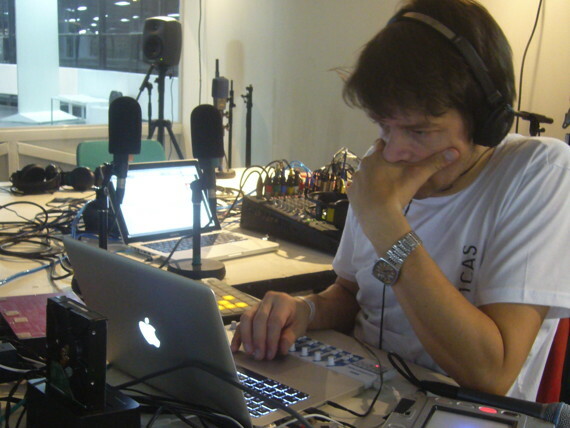 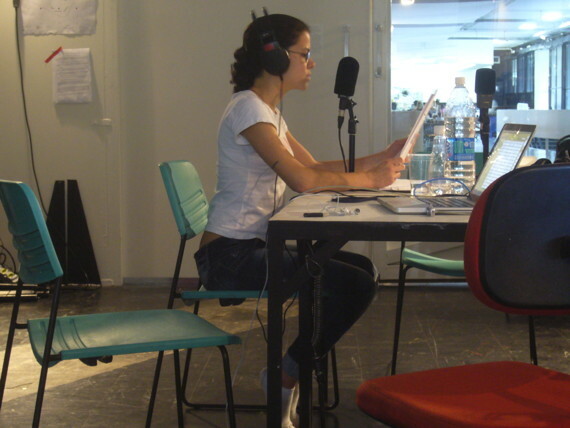 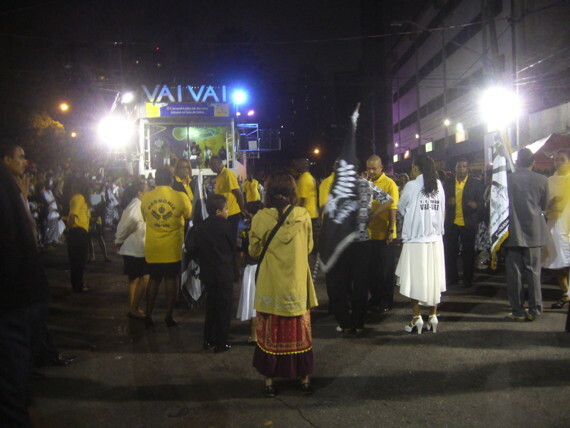 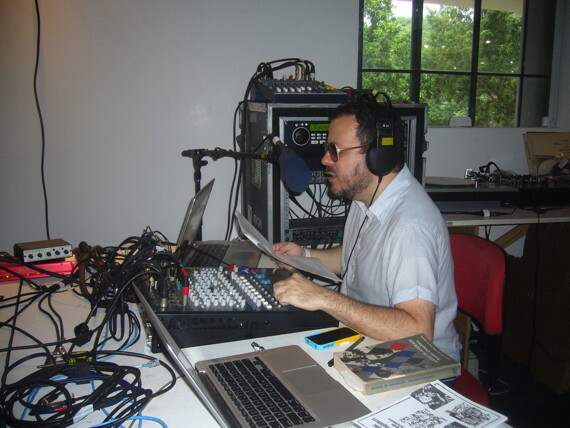 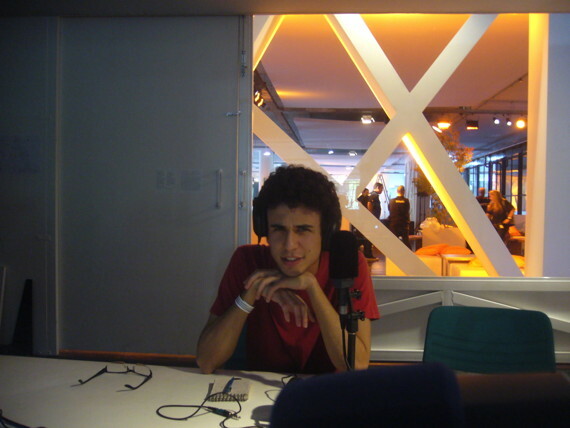 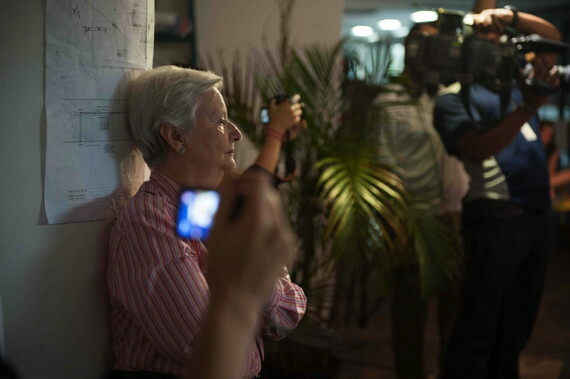 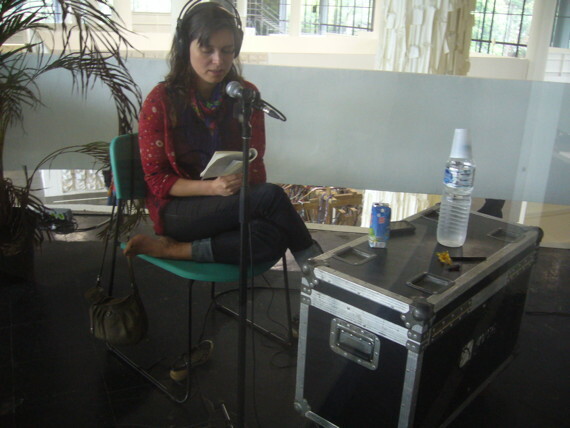 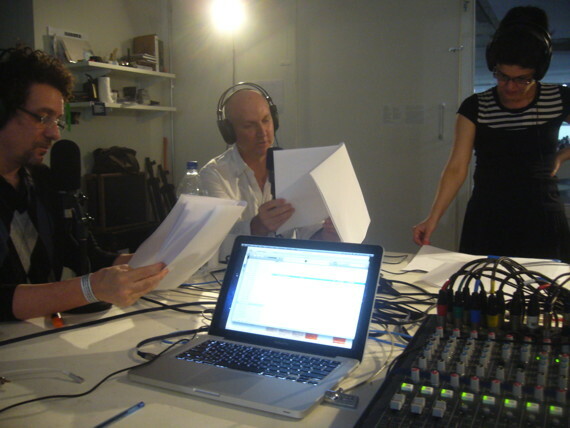 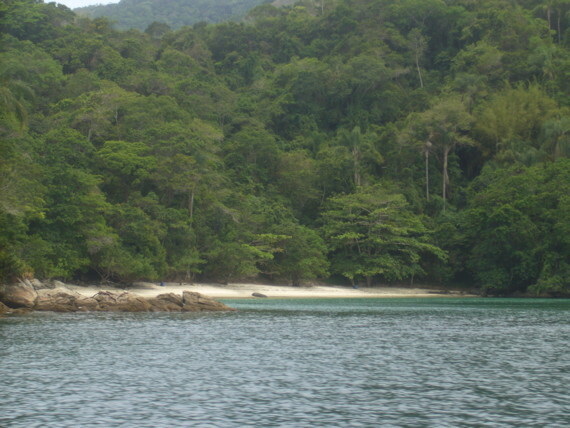 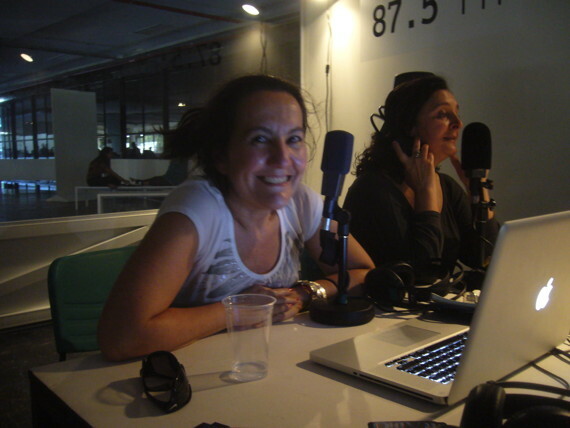 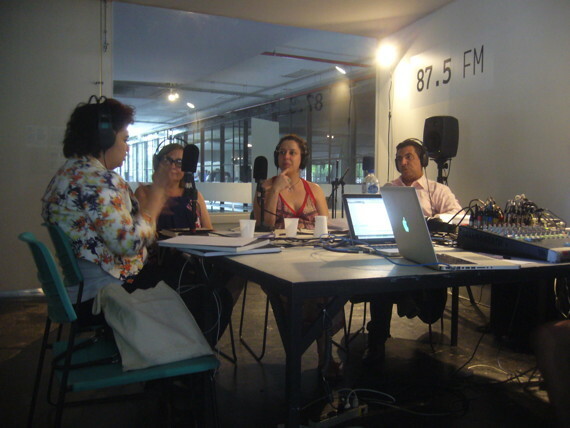 The night hours were prerecorded, and during the daytime the reading was done live at the Mobile Radio BSP studio by a host of Brazilian luminaries. 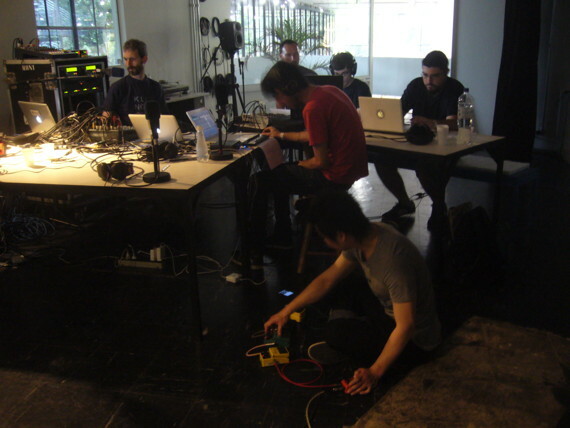 The string of international guests who came to join us for a one-week mini residency continued with Børre Mølstad from Norway. 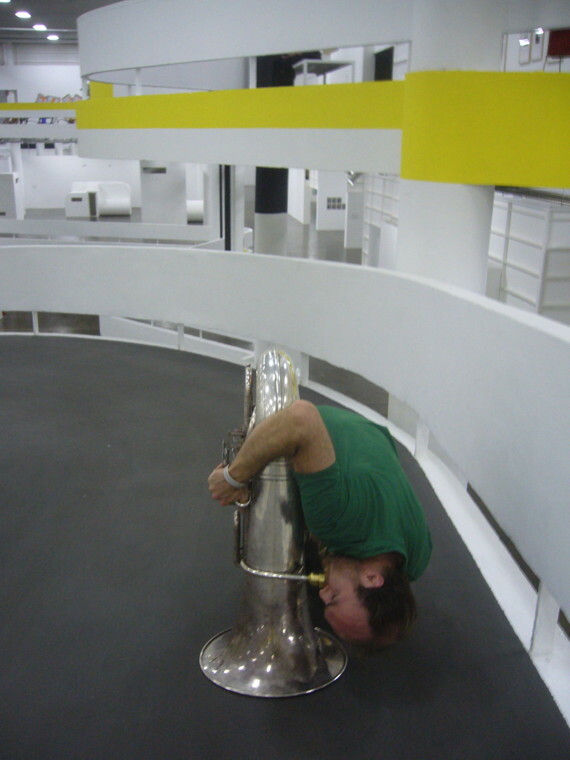 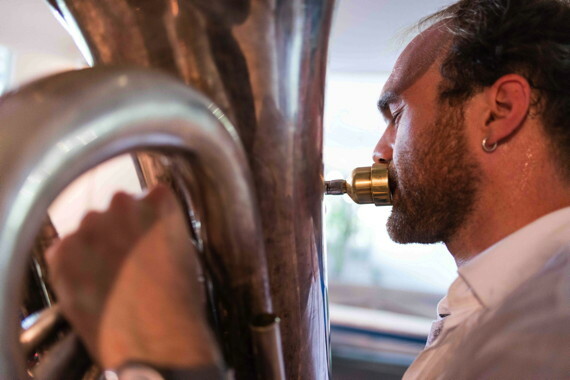 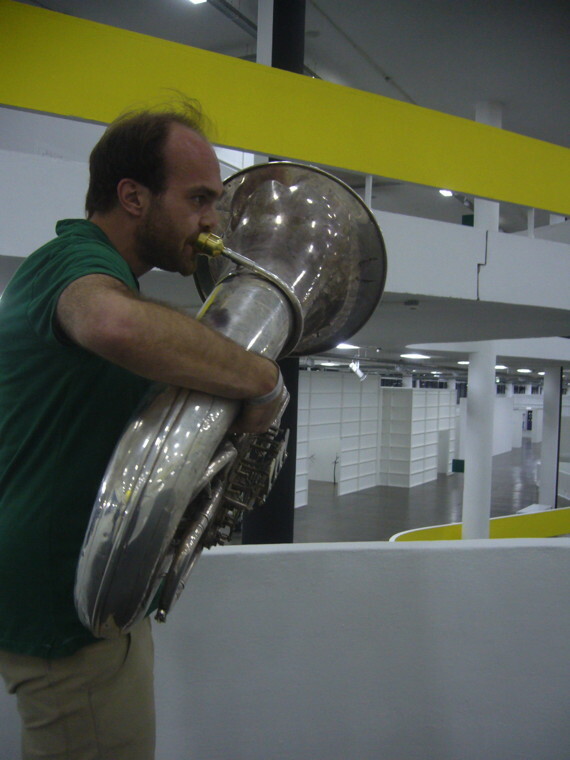 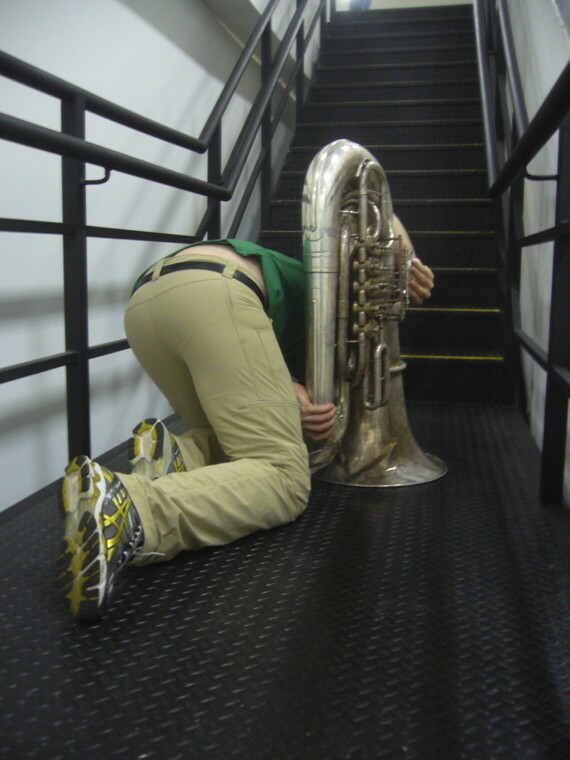 He and his tuba were particularly interested in the architecture of the Bienal pavillion that was designed by Oscar Niemeyer (listen). 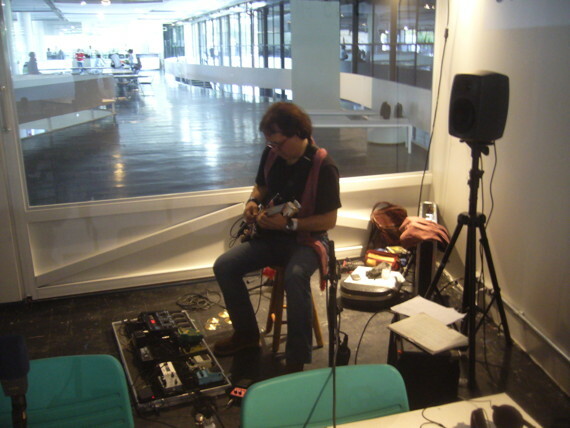 We also used the chance to play a trio with him. 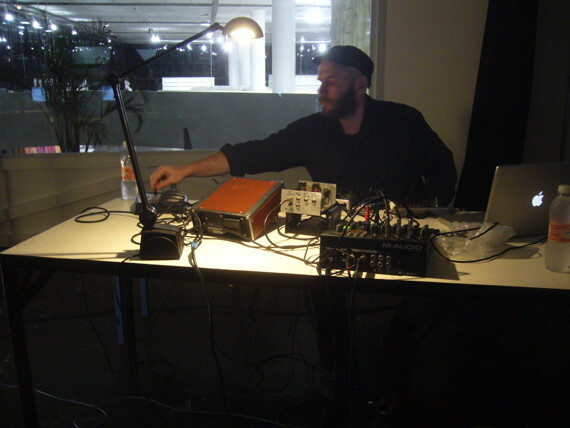 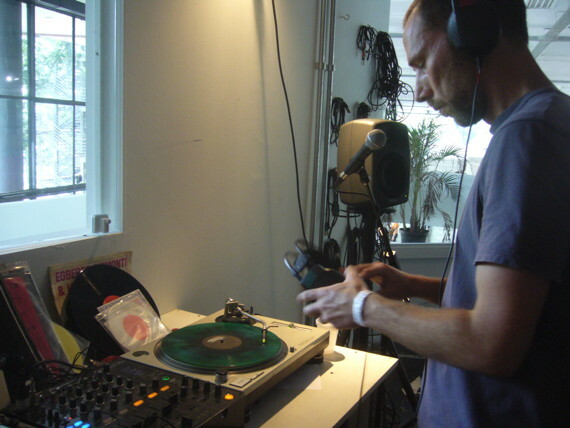 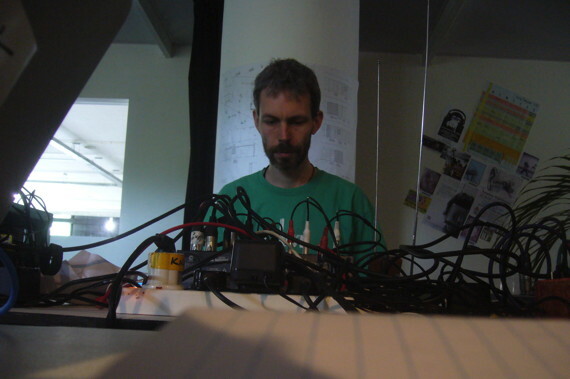 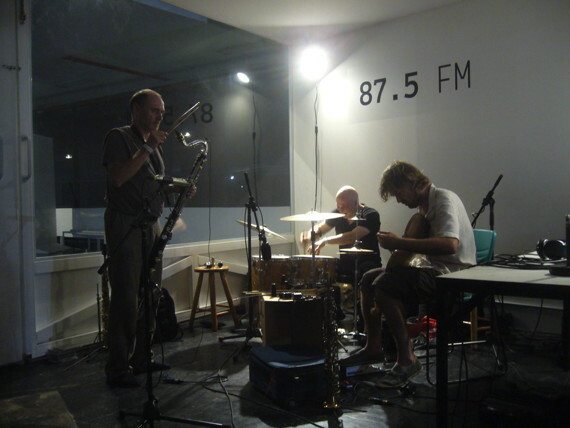 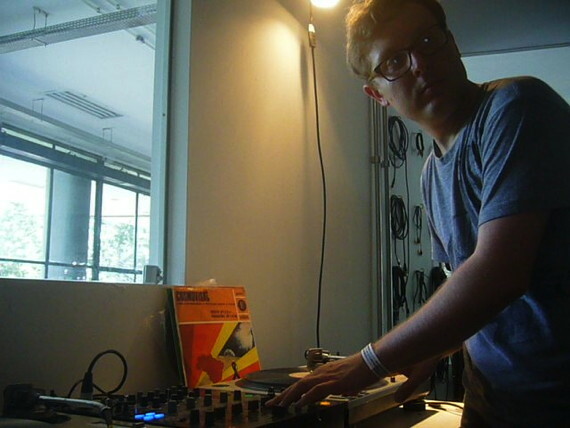 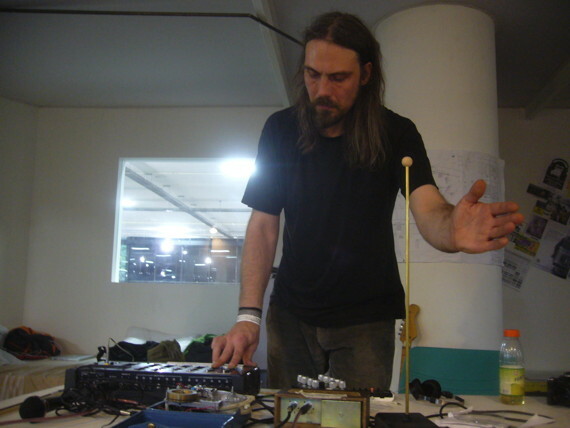 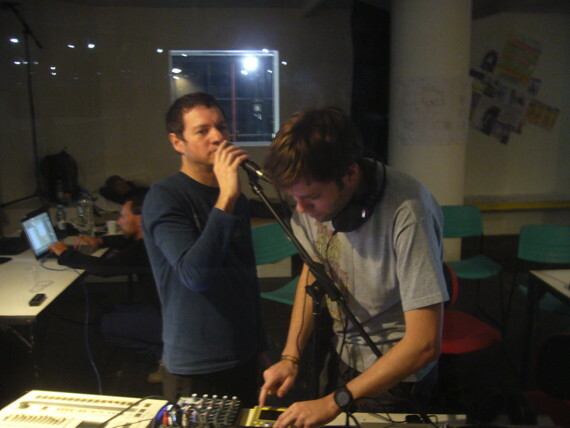 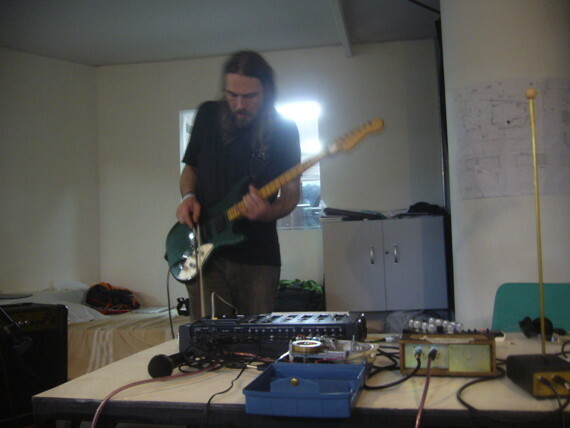 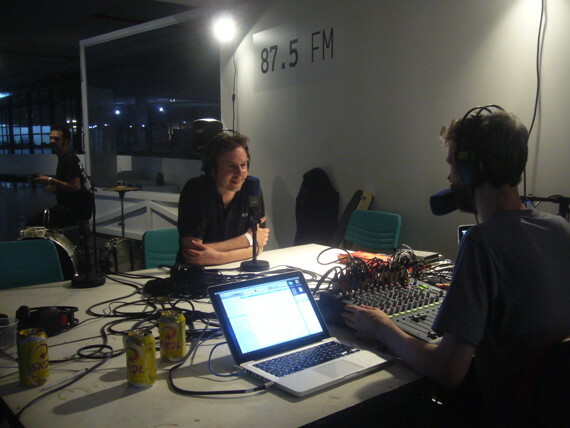 Further mini-residency guests were Mikkel Meyer from Denmark who brought with him a large archive of early digital Danish radio experiments and Billy Roisz and dieb13 from Austria who recorded both the acoustic and electromagnetic environment in São Paulo for their live radio performances (listen). 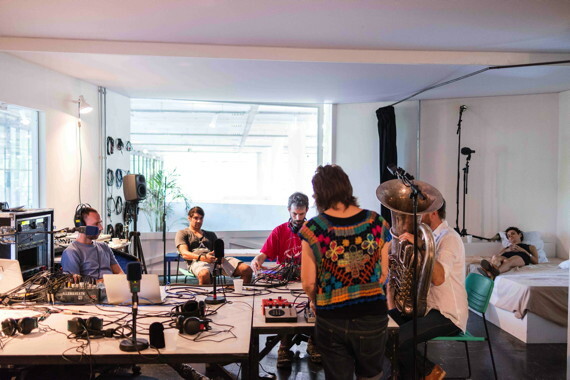 Some of the occasional visitors to our studio are pictured below: Lady Incentivo (listen), Leo &amp, Seyran Freitas, Morbo y Mambo, idos ö idos, Brandon LaBelle (listen), Guy Brett, Mariana Lanari and Luca Forcucci &amp, and Ricardo Garcia (listen). 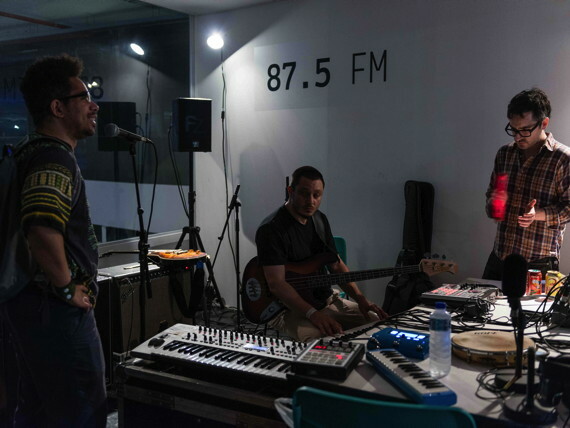 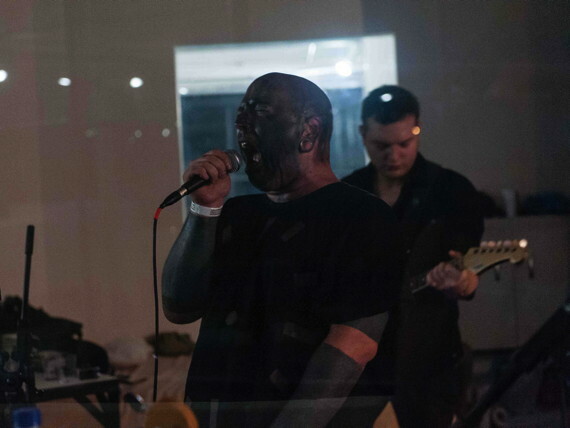 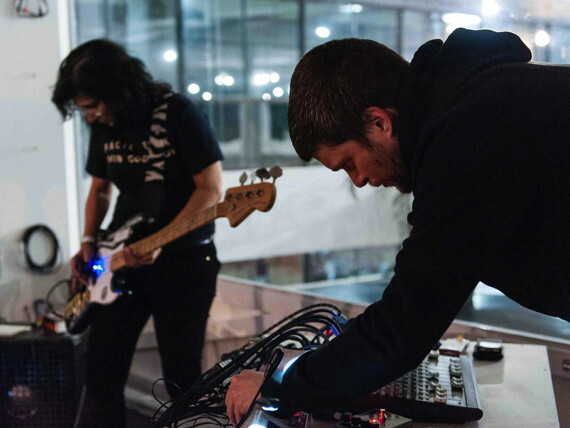 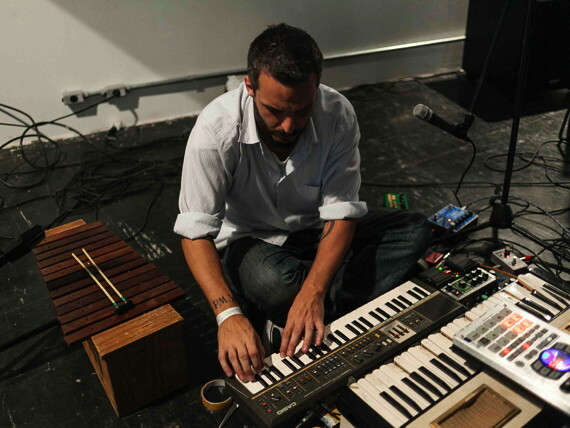 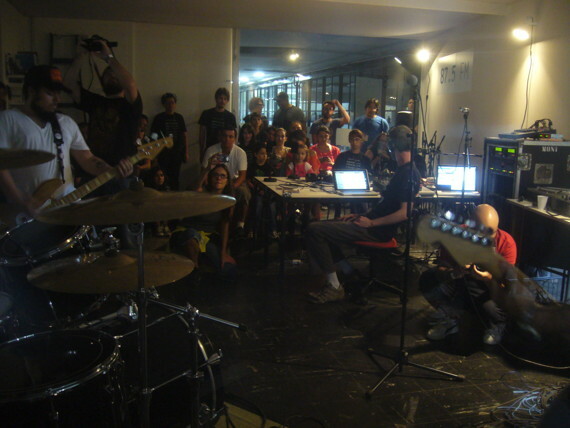 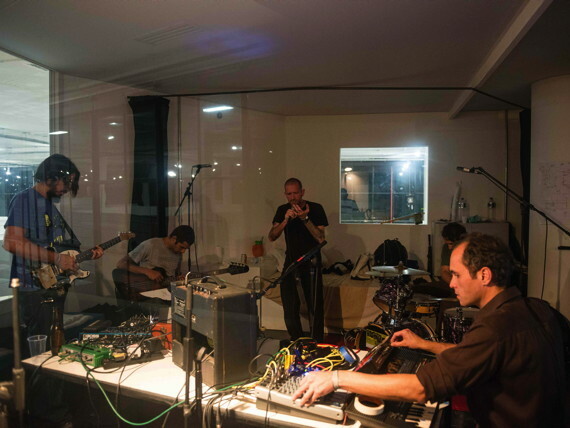 We used our chance to be active outside the Bienal and played a concert in one of São Paulo’s coolest venues Trackers, only 5 minutes walk away from our home at the Residência Artística FAAP. 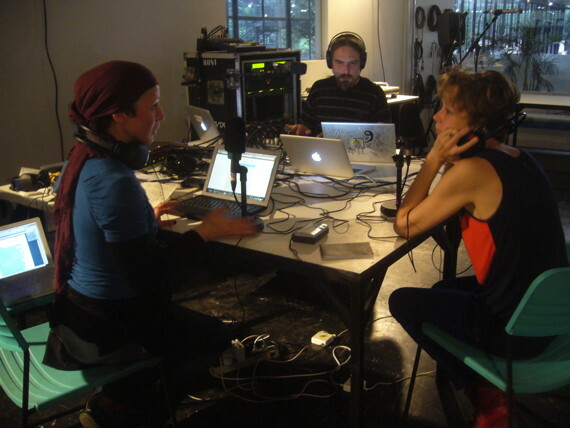 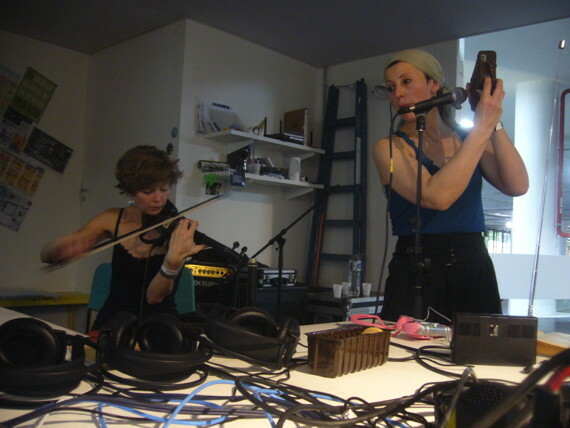 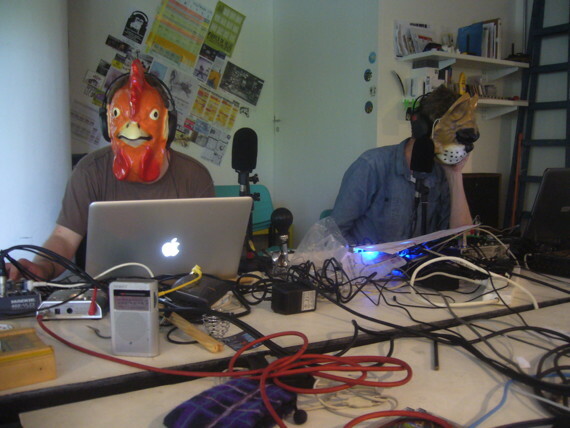 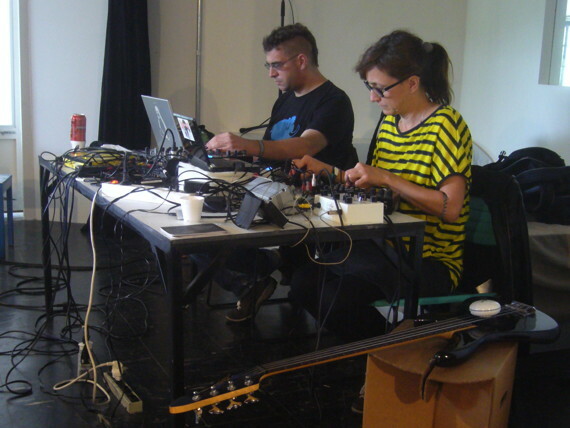 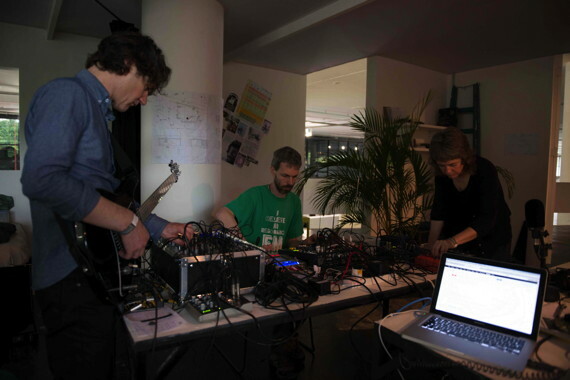 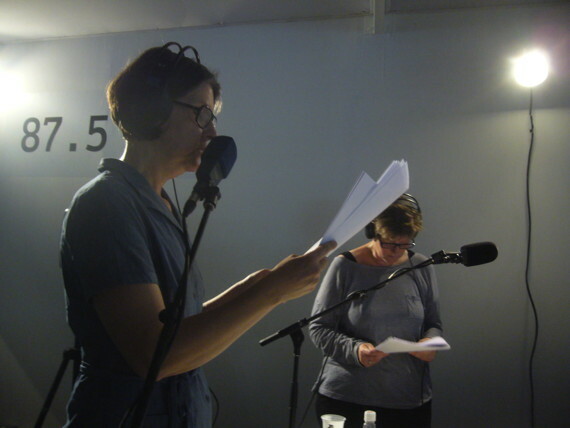 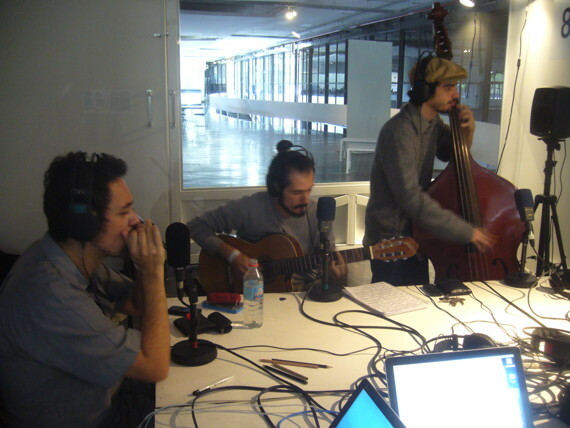 Lokaalraadio from Estonia (Katrin Essenson, Hello Upan and Raul Keller) occupied the last mini-residency in October with stories about their Baltic homeland (listen) and a live performance (listen). 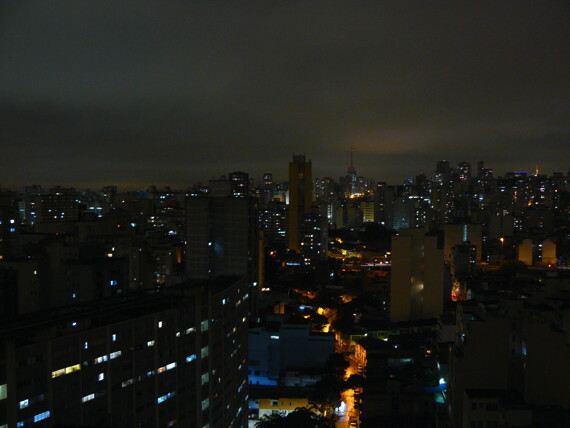 The last Sunday of October was a quiet day. 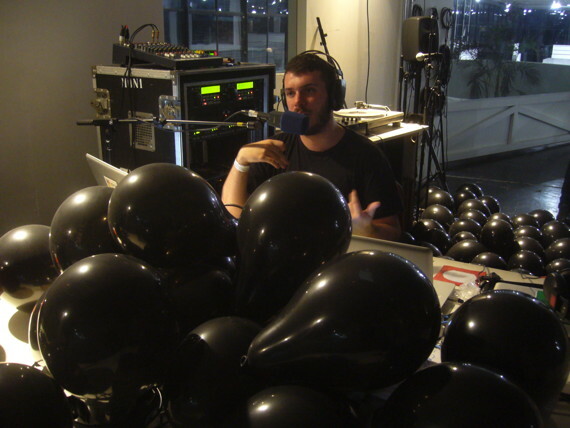 There was time for Knut to set up undetected for an impromptu solo performance, just for the radio listeners. 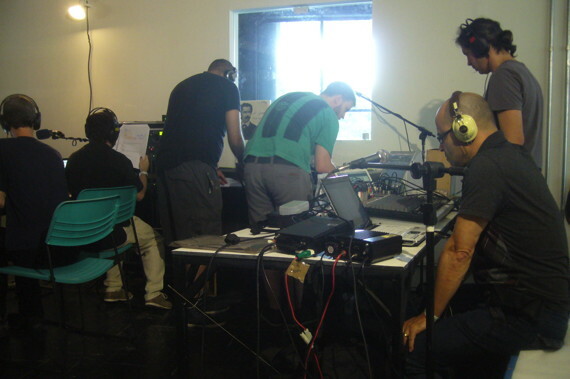 The rest of September continued with many varied guests visiting the radio studio. 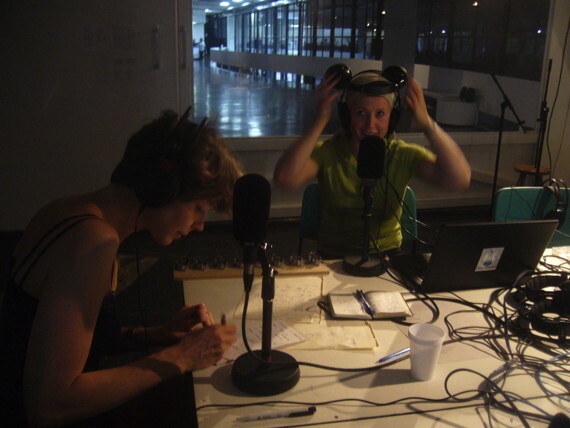 akcg (Anna Kindgren and Carina Gunnars) from Sweden were in town on a different mission and we joined up with them to read the first chapter of their book agorafobi/agorafobia/agoraphobia in Swedish, English and Brazilian Portuguese. 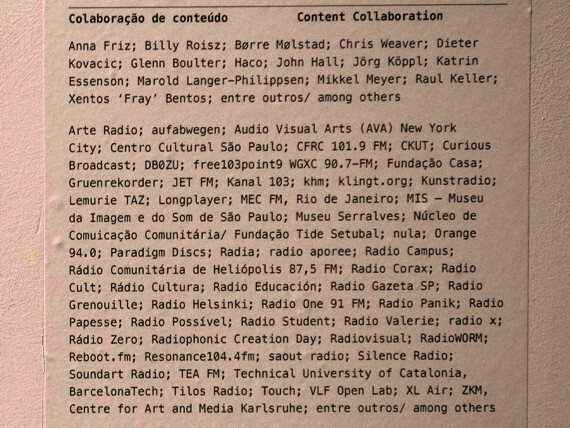 An overlayed mix of the three languages made it onto our archive afterwards. 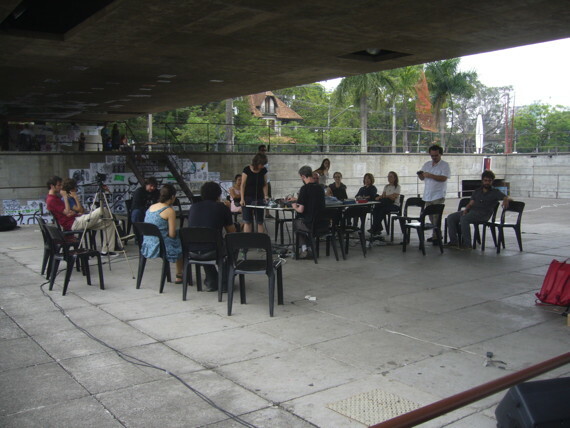 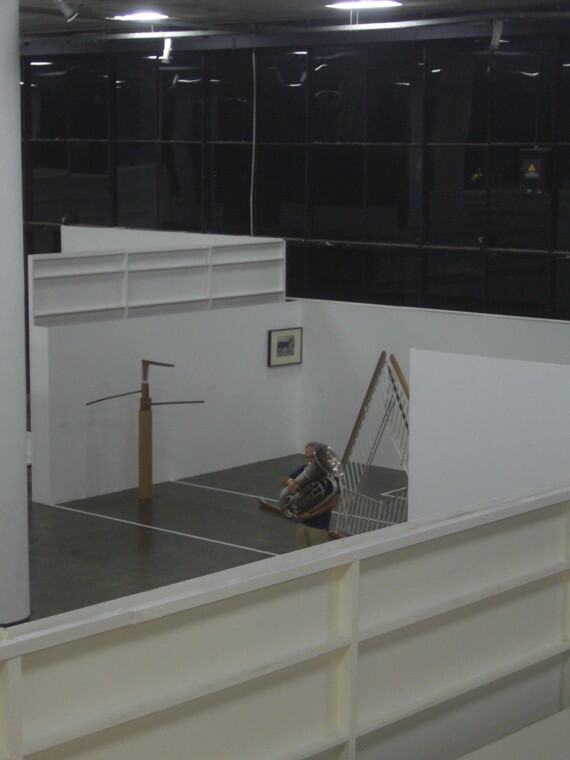 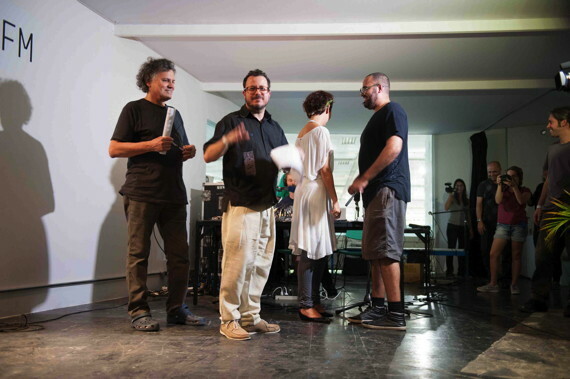 As the rest of the Bienal artists were destined to leave São Paulo after setting up their works we took our chances to invite them to our studio along with an ever-increasing number of local artists, musicians, curators and Bienal visitors. 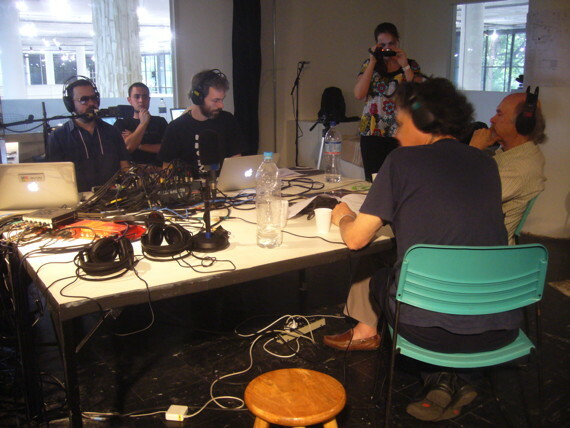 Pictured below are John and Nina Zurie, Leandro Tartaglia, Movimento Sincopado (listen), José Roberto Leonel Barreto (listen), Ana Gonçalves Magalhães, Oval/Markus Popp (listen / listen), Guto Carvalho (listen), Bienal book launch, Simon Foxall, Afro Hooligans (listen) and a visiting photgraphy class. 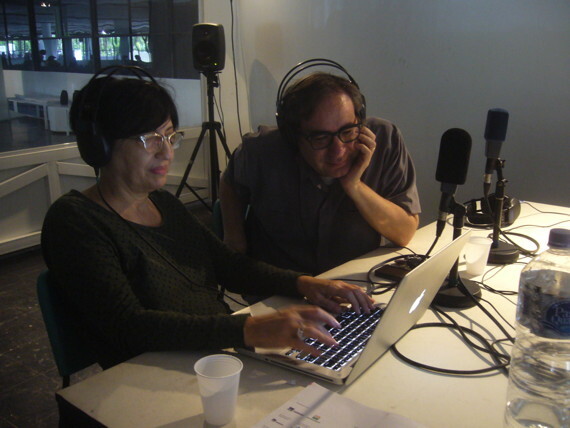 Into the second week of broadcasting regular shows were taking hold in our schedule. 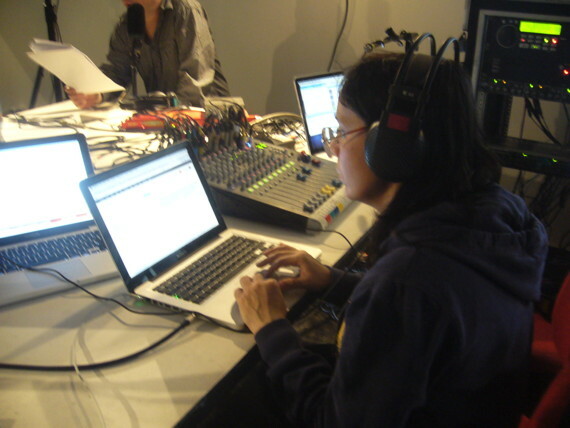 Around these shows we allowed for maximum flexibility in terms of programming – if somebody interesting showed up, we could often go straight to air with them. 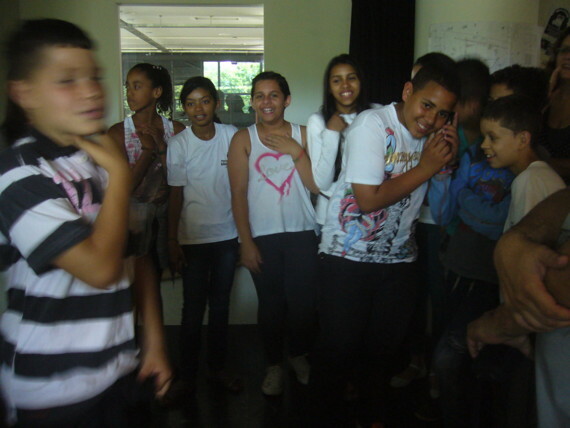 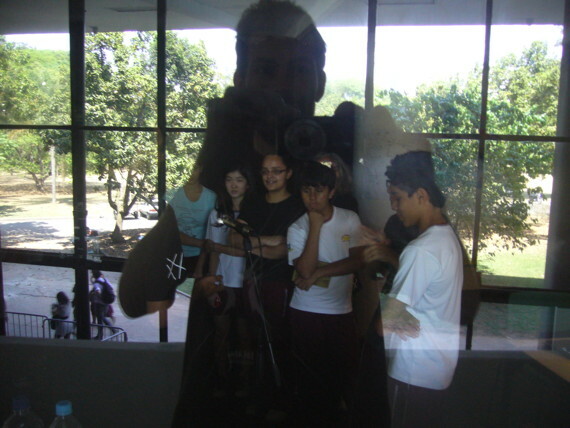 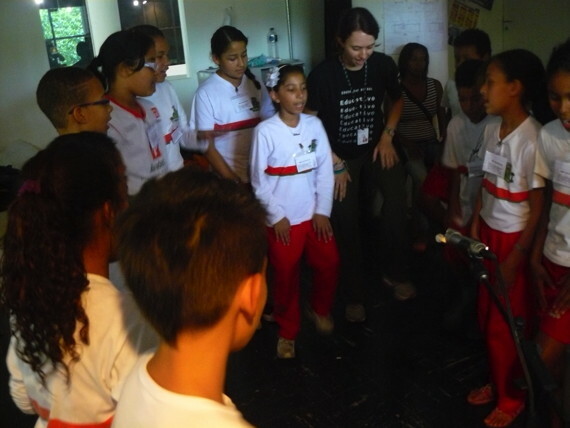 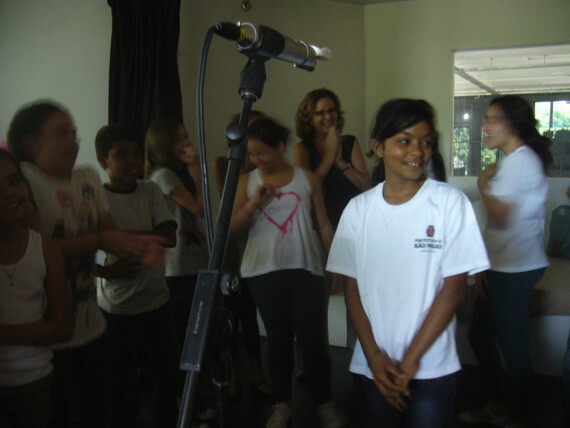 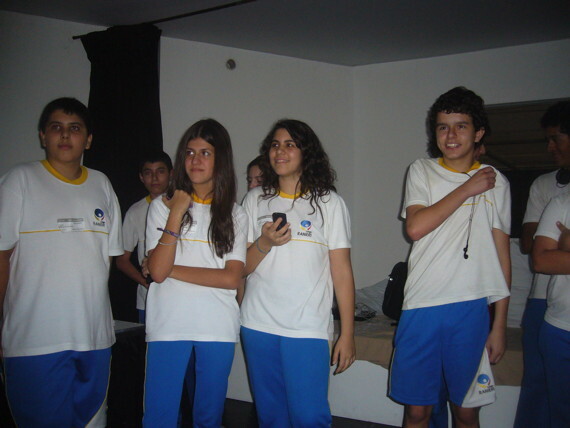 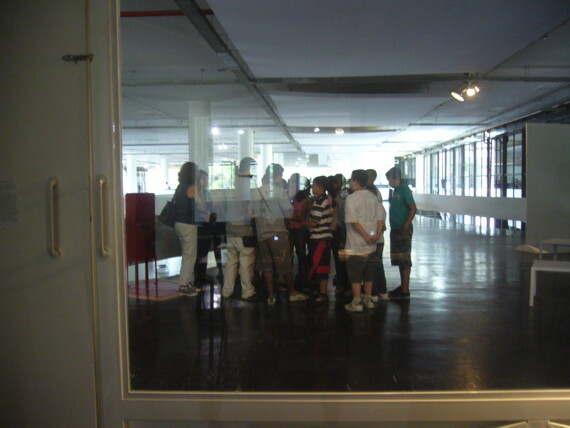 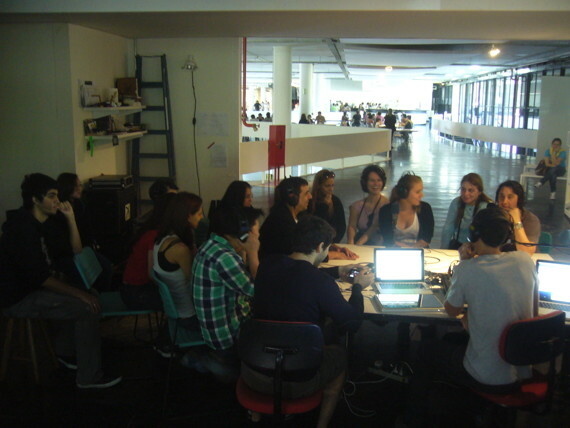 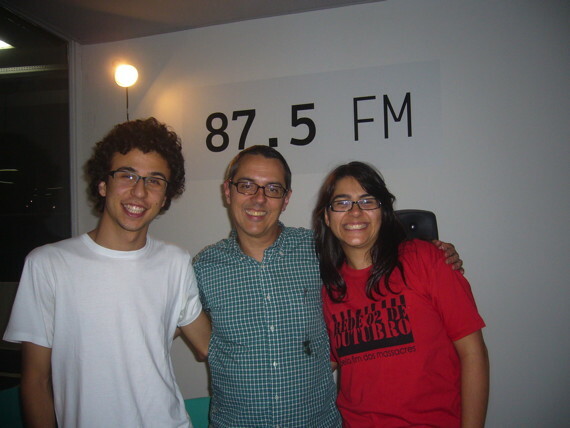 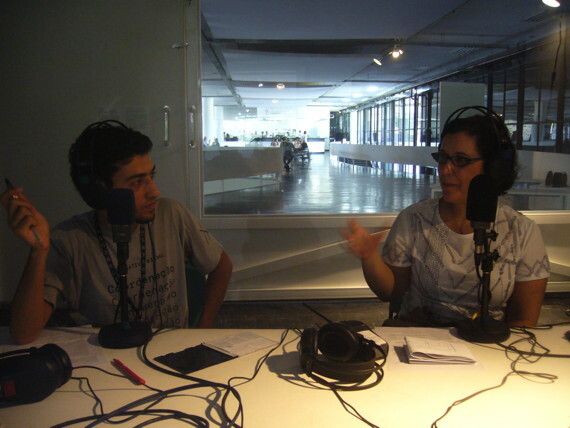 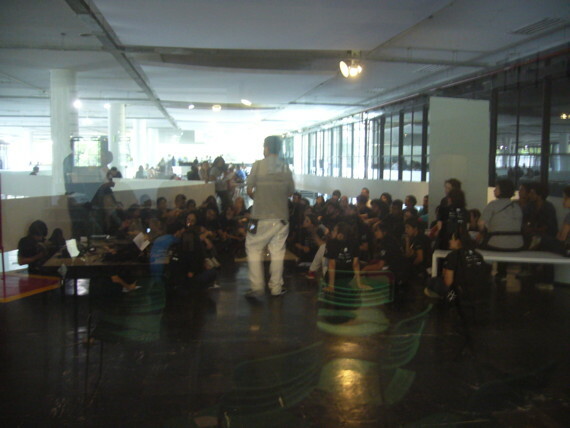 Every weekday the excellent Bienal education team visited the radio either with one of the 150 daily school classes that were visiting the exhibition, or to present their own show. 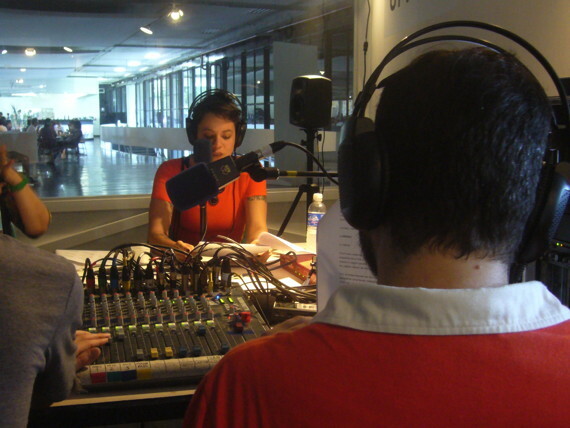 So much excitement on air! 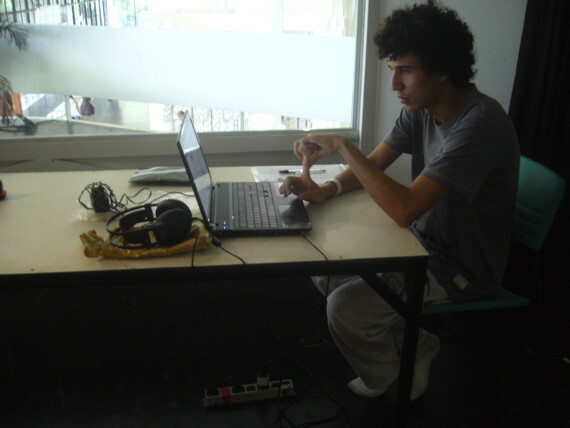 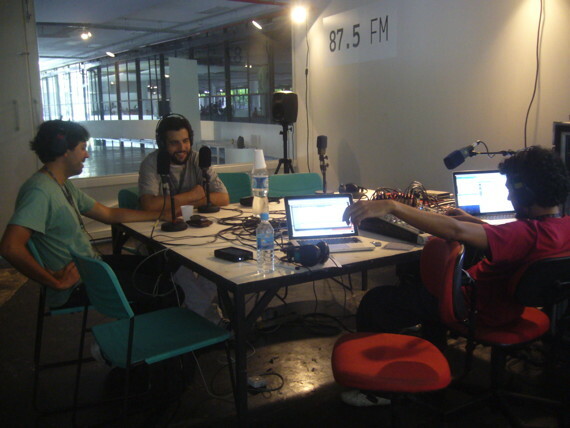 Thanks to our Bienal producer Joaquim Millan (below, white t-shirt & walkie-talkie) we eventually got an updated FM transmitter that could cover the square kilometer broadcast range we had been allocated, and a decent radio receiver at the benches outside of our studio which became a listening post and resting point for visitors. 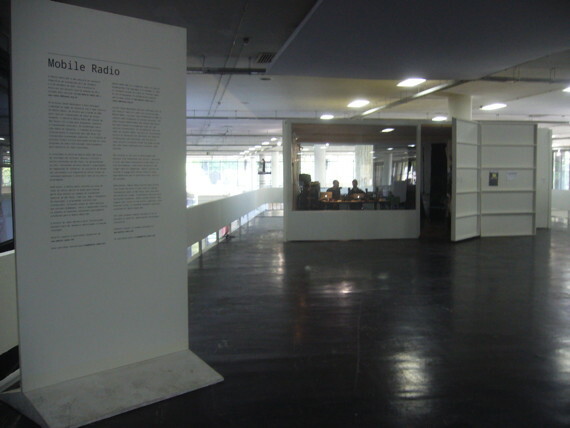 If they wanted to continue listening they could also pick up a portable radio at reception to carry through the exhibition. 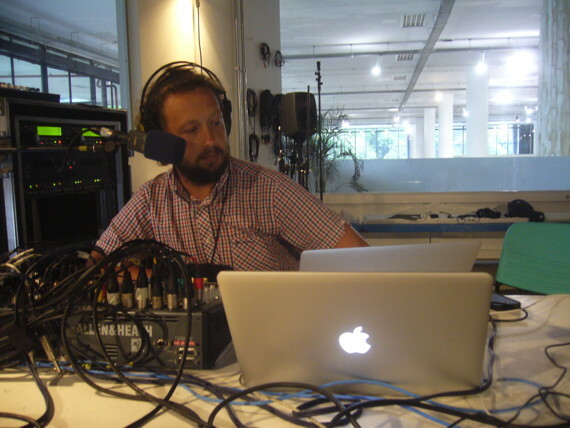 The new transmitter also allowed for Knut’s live radio installation Dune o’Din to function properly as part of our nighttime broadcast series Better Silence. 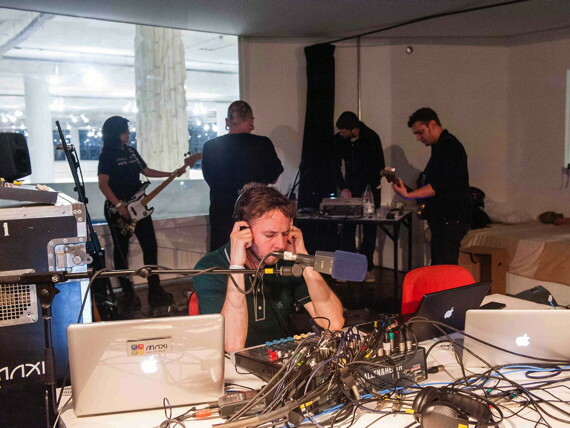 We wanted live broadcasts 24 hours a day, so we used various live streams to cover the periods when the exhibition was closed. 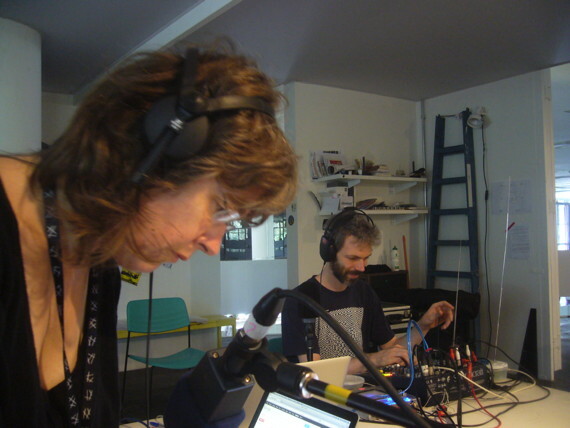 As well as Dune o’Din you could tune in at night to hours of beautiful pops and clicks of sun spots and lightening strikes from a natural radio signal broadcast from Todmorden in the UK (as opposed to our own ‘unnatural radio’! 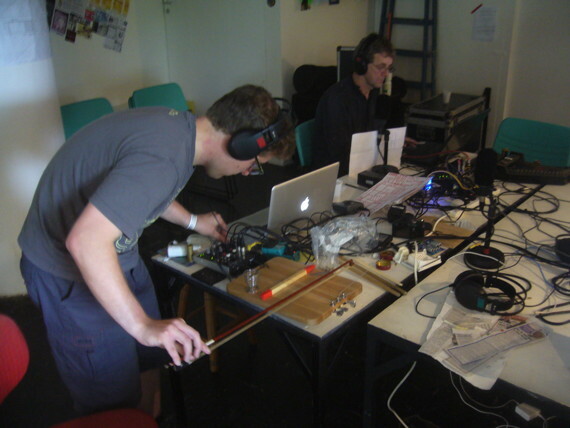 ), a marine microphone in Ireland listening for whale calls, online field recording streams (Brazilian birds provided by Rádio Paisagem and global soundscapes from radio aporee) or else algorithmic compositions (the 1000 year chiming Longplayer by Jem Finer and Zellen/Silben by Jörg Köppl which generated fake Portuguese phrases). 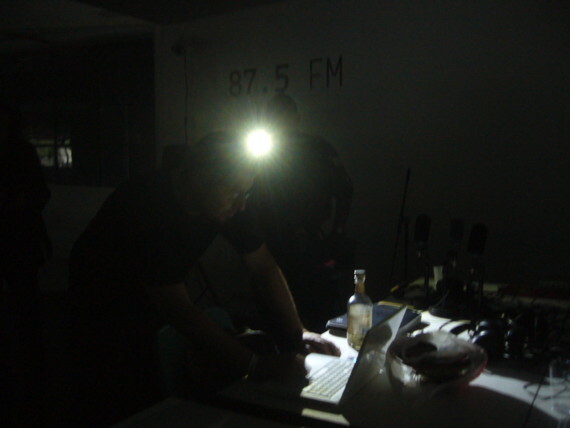 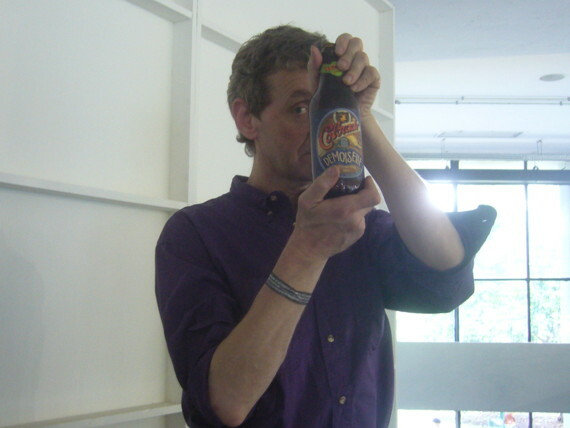 We did some out of hours broadcasts ourselves, but it became increasingly difficult to remain in the building due to (mainly farcical) security issues. 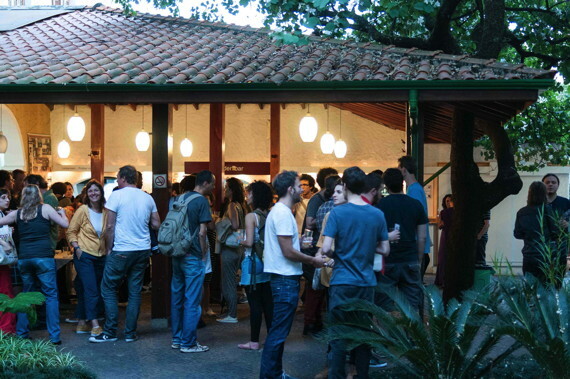 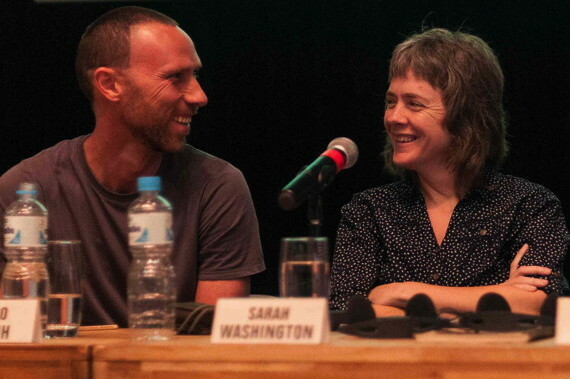 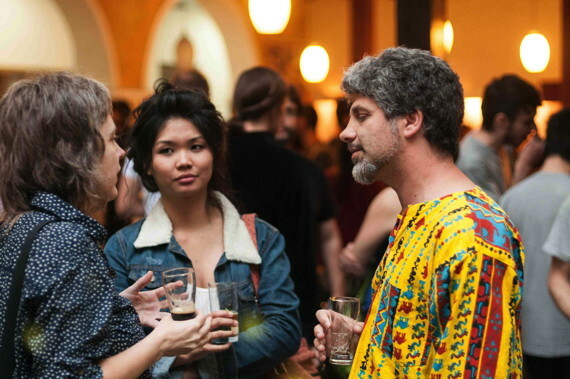 One of the great advantages of being part of the Bienal was gaining the opportunity to invite fellow artists from around the world to join us for a week at a time, with a high chance that their respective national funding agencies would support them. 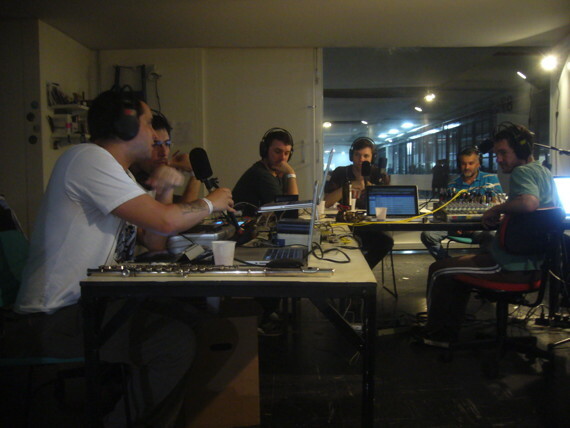 Together we managed to secure an impressive roster that covered nearly every week of broadcasting. 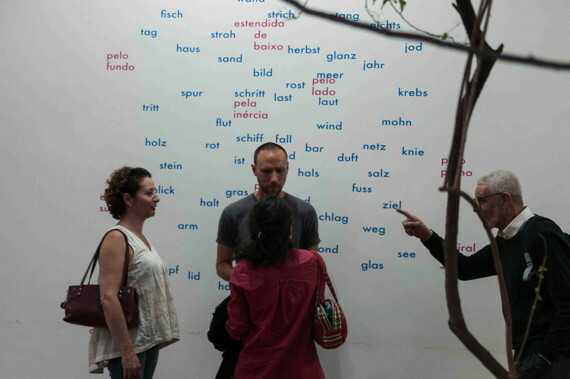 The first visitor was Jörg Köppl from Switzerland. 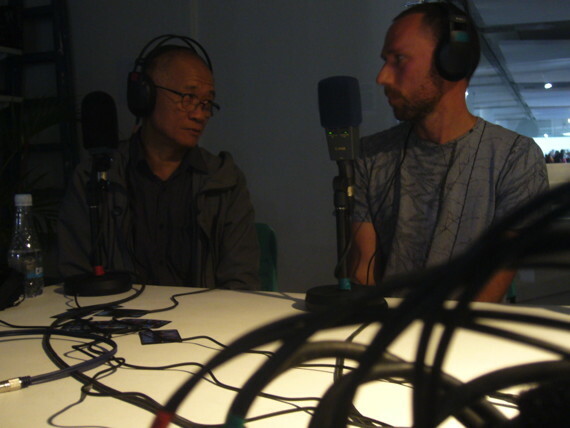 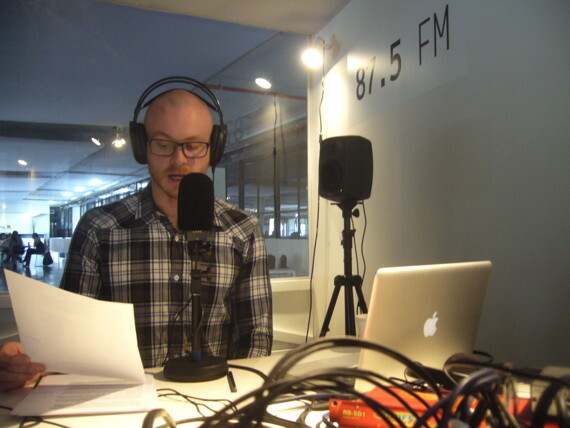 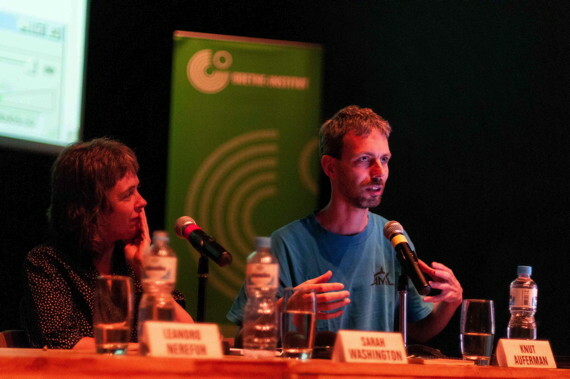 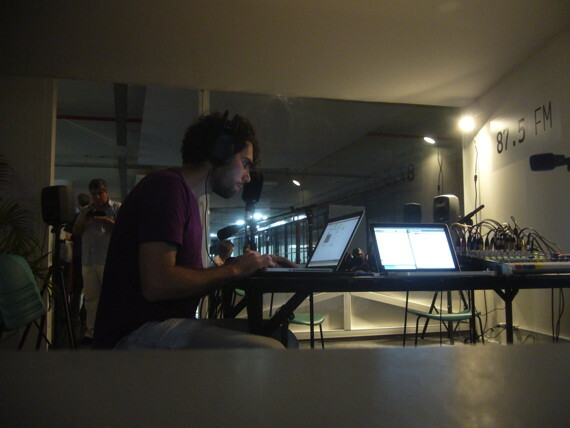 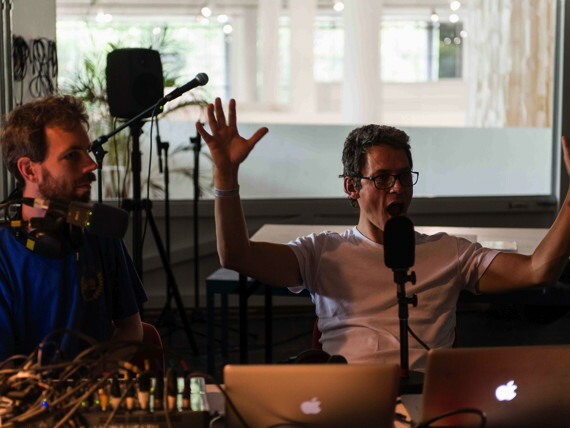 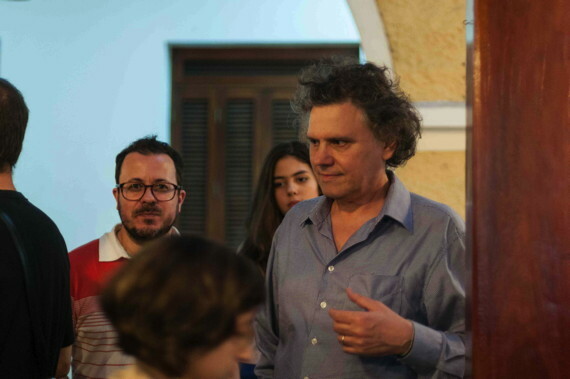 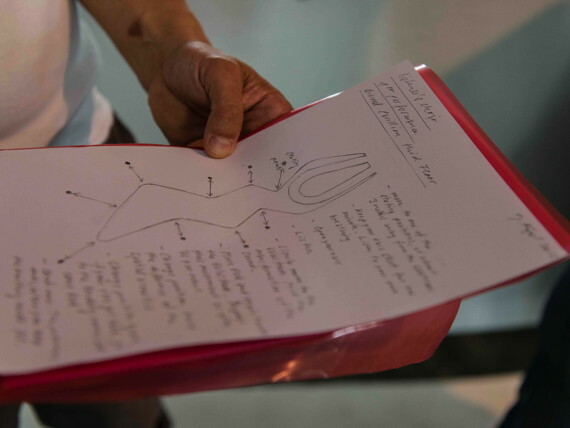 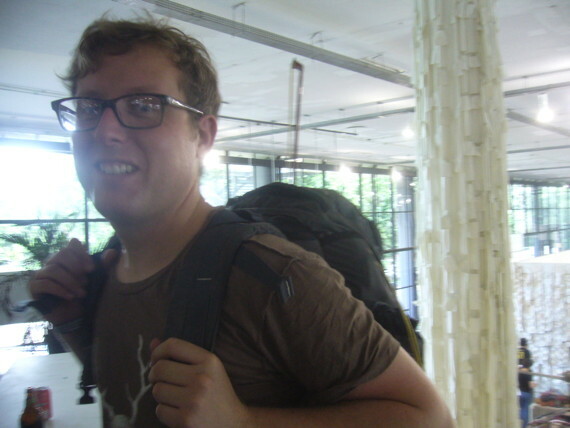 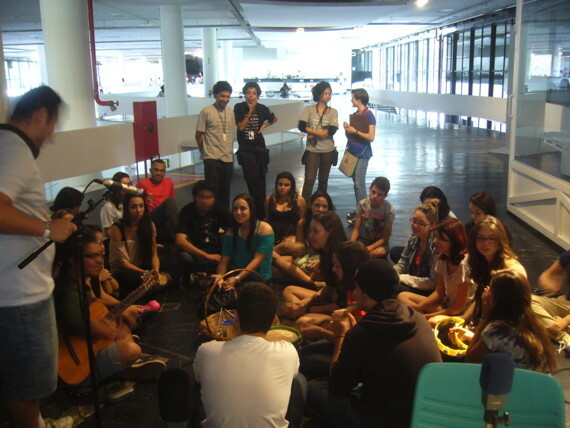 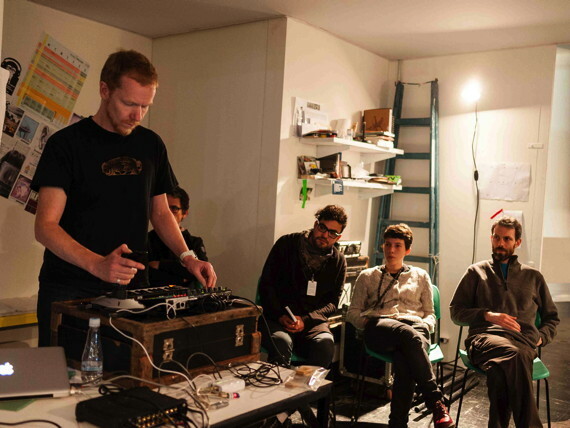 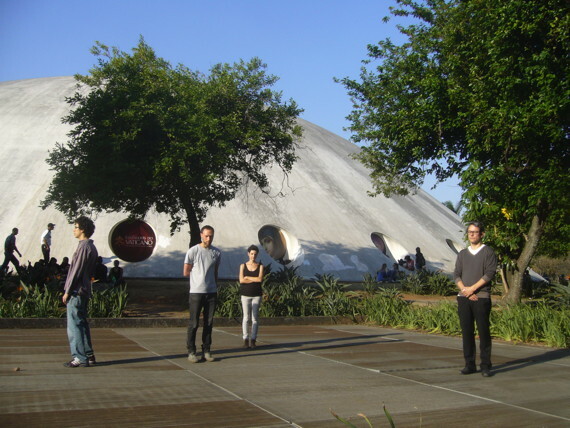 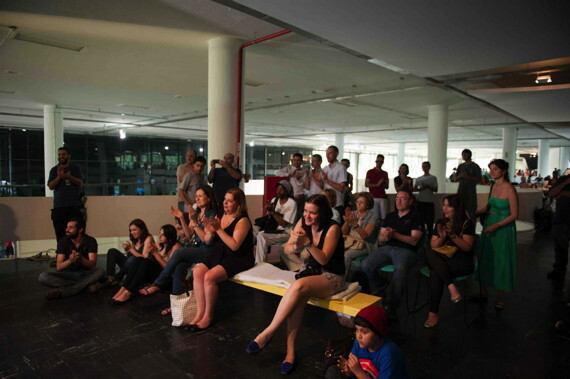 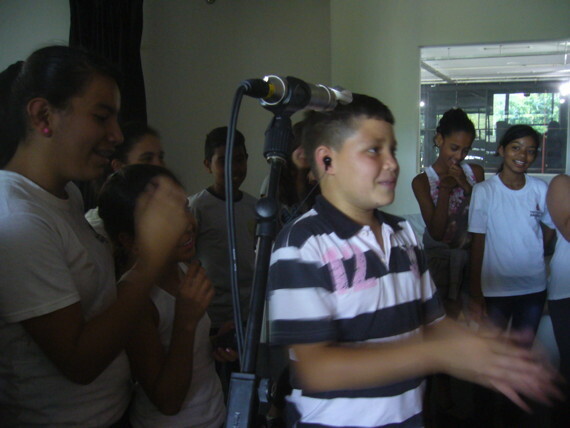 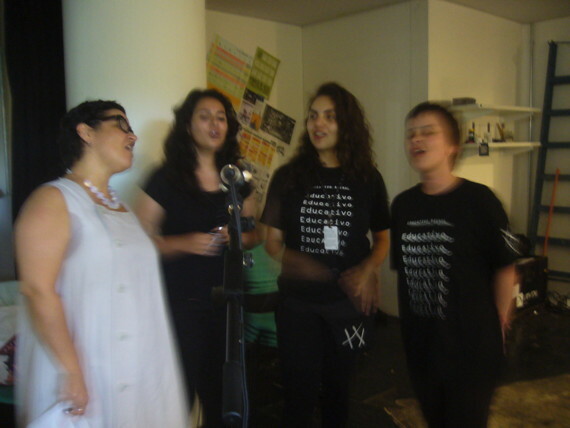 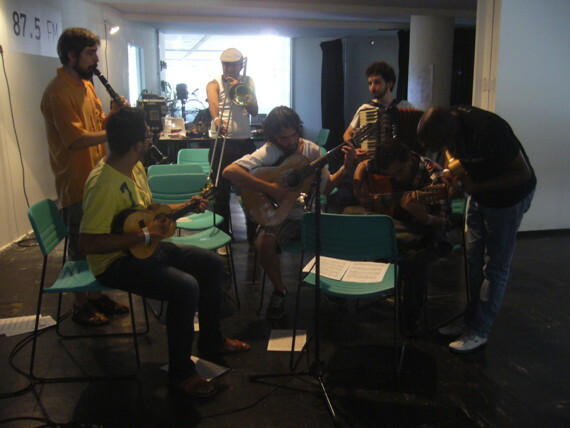 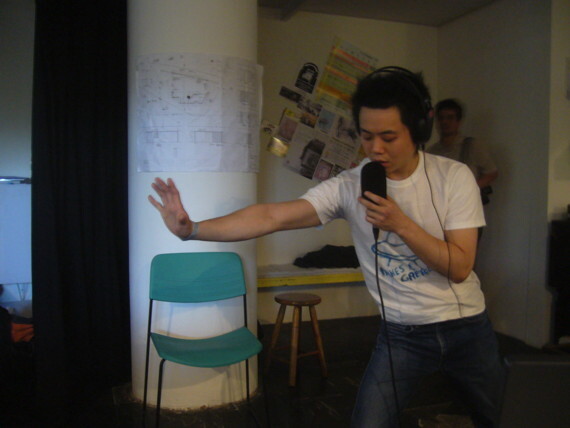 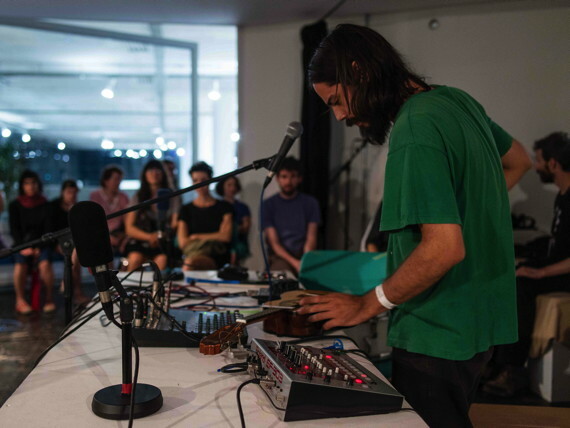 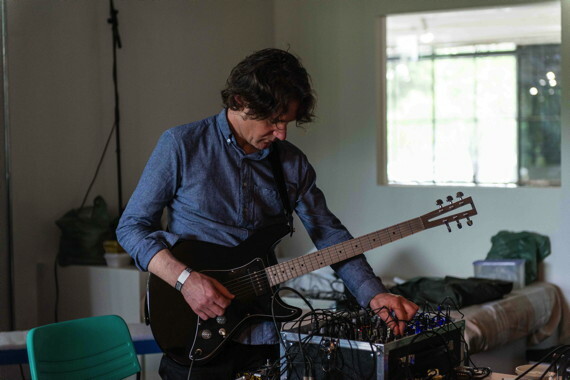 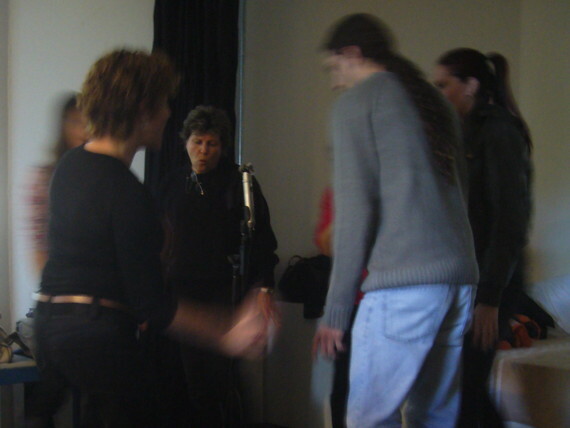 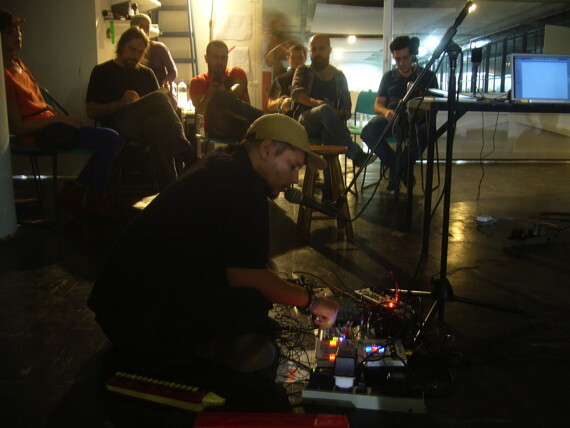 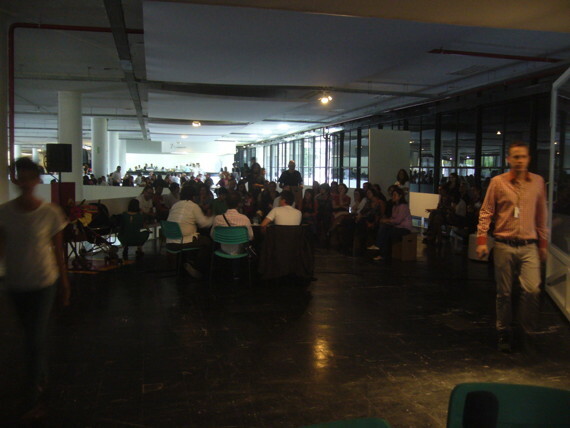 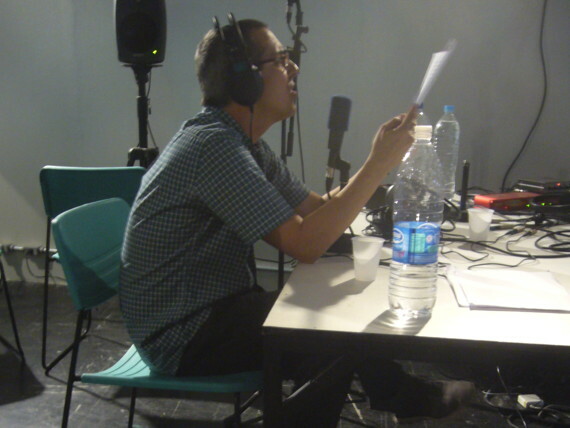 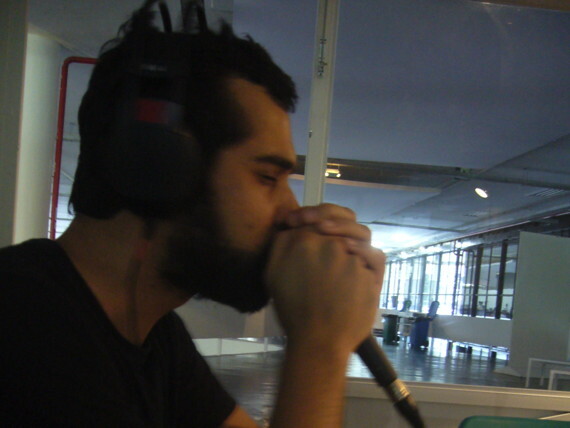 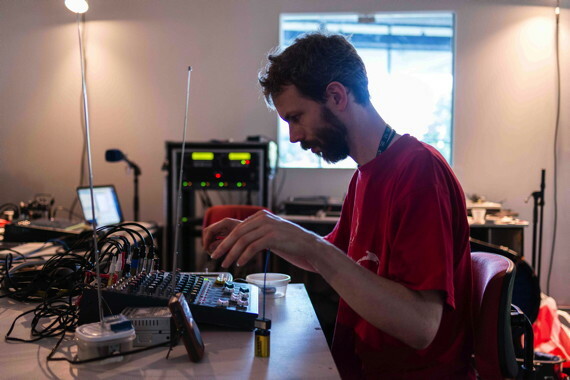 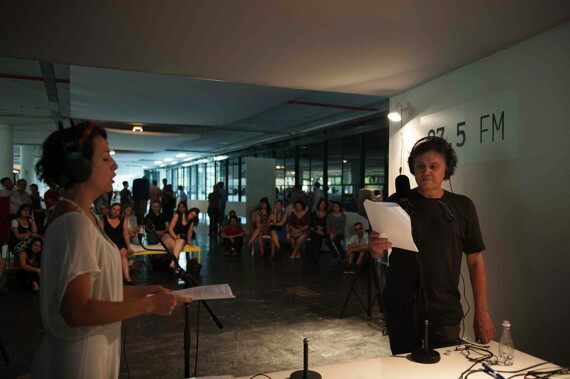 His contribution was a daily on-air workshop called The Listening Choir (listen) that culminated in active listening sessions for the participants in and around the Bienal pavillion. 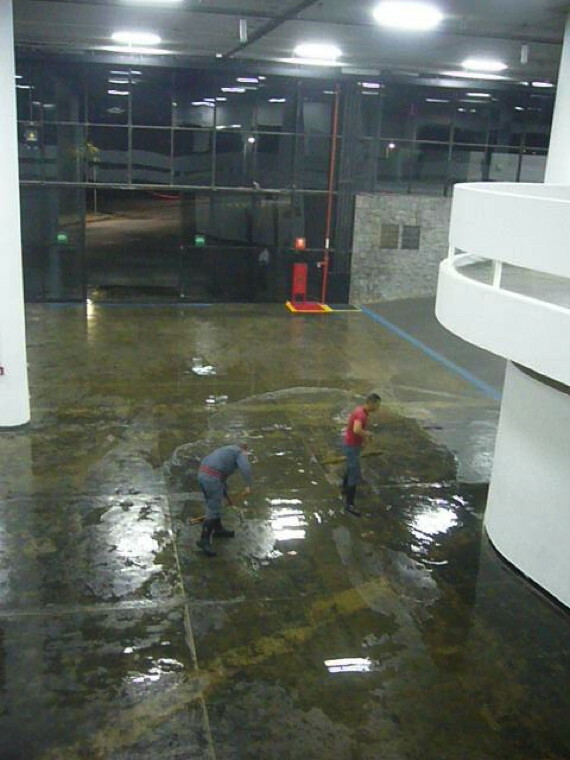 One late night session ended with some confused bombeiros escorting us out of the building after encountering a group of people sitting on chairs with their eyes closed, ignoring the expected closing routine of the exhibition. 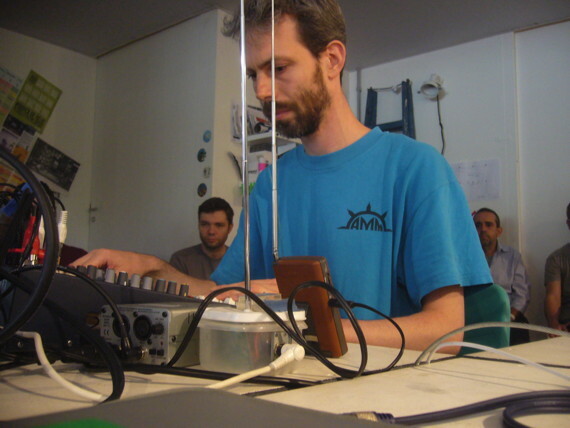 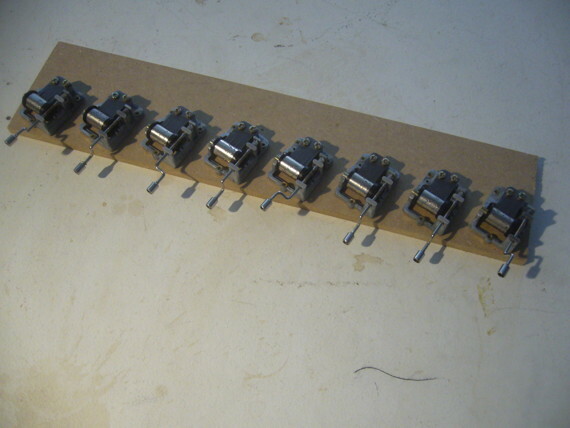 Jörg also left us a specially adapted version of his algorithmic composition Zellen/Silben noted above. 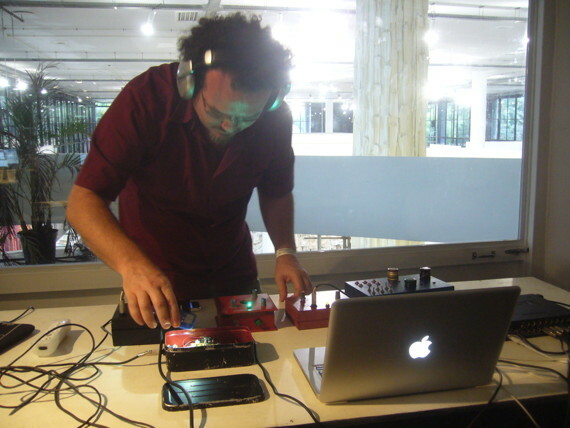 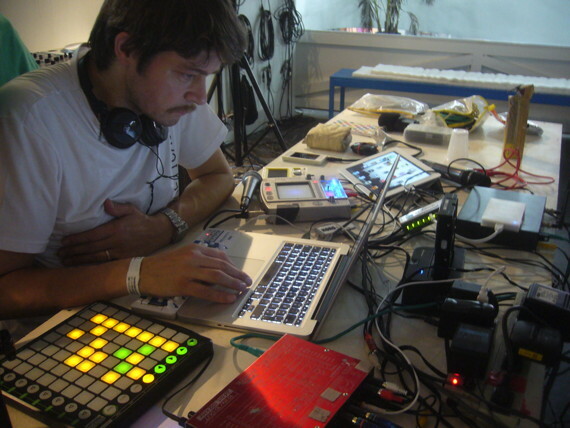 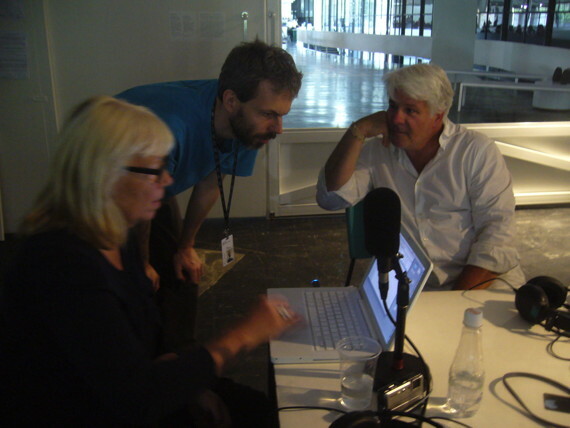 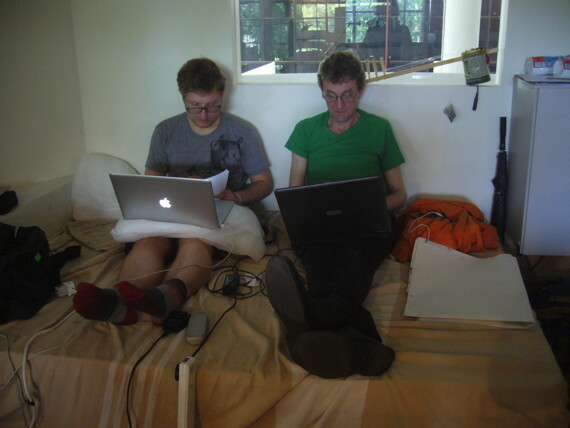 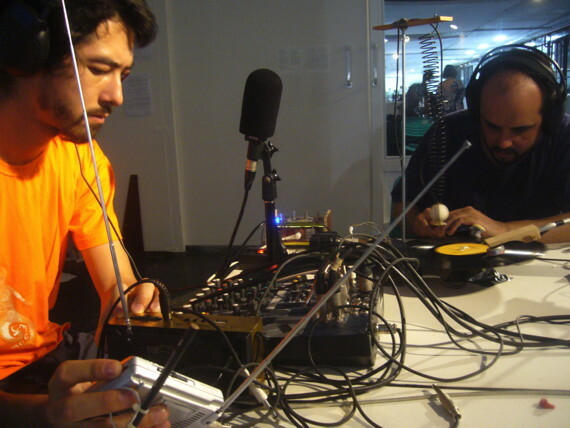 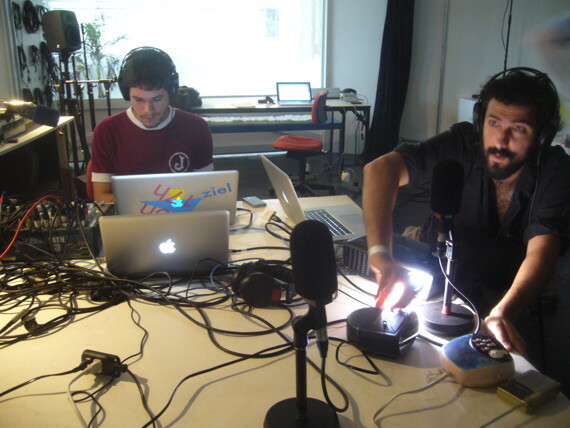 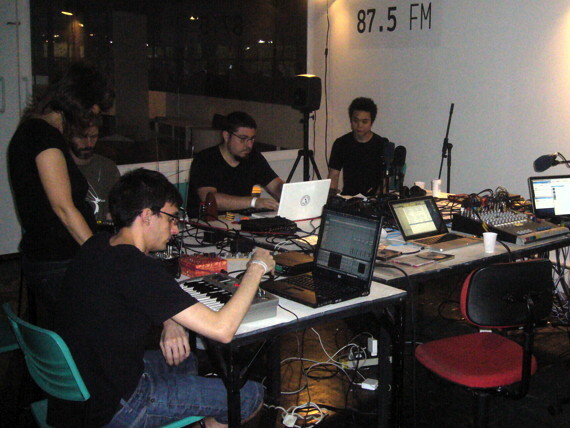 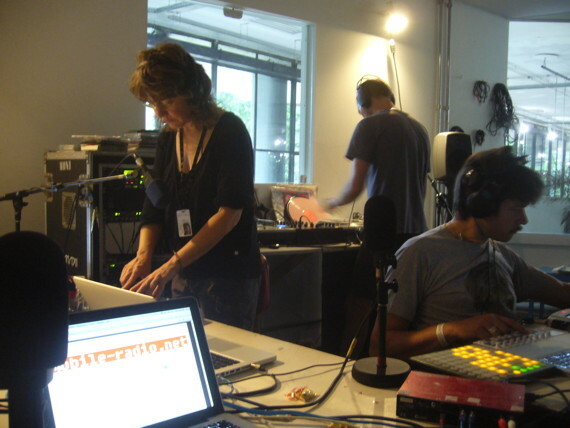 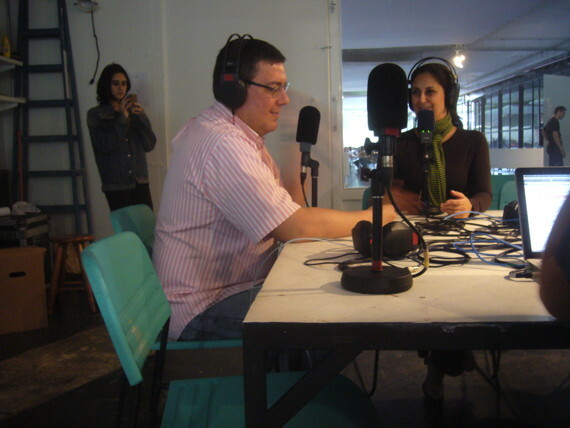 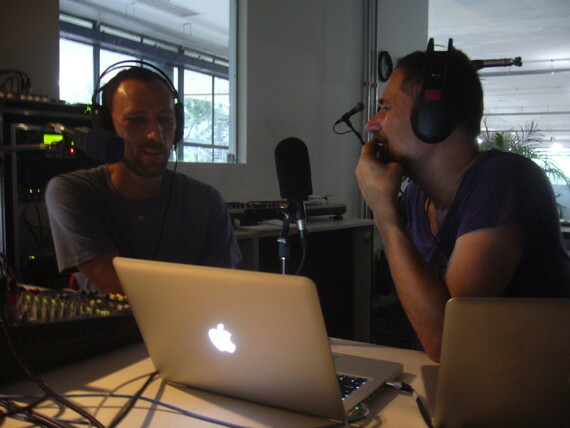 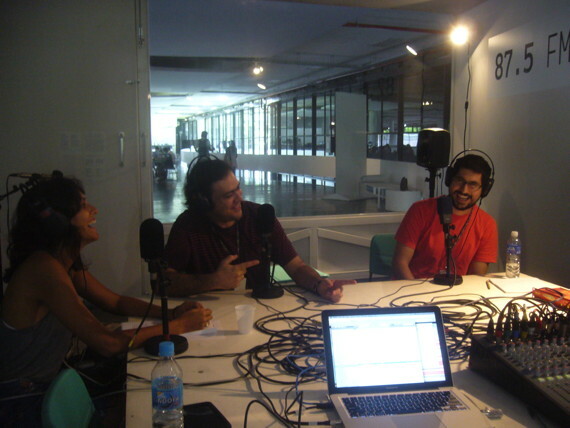 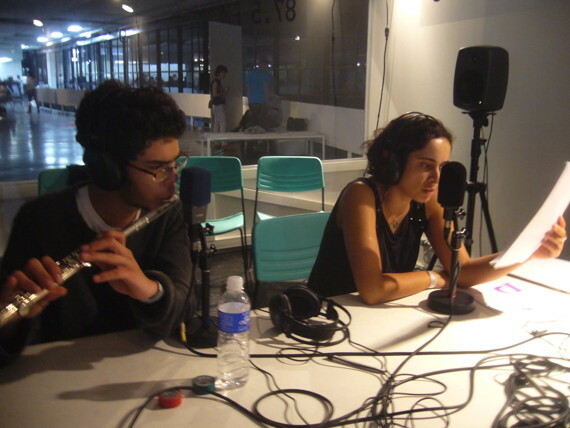 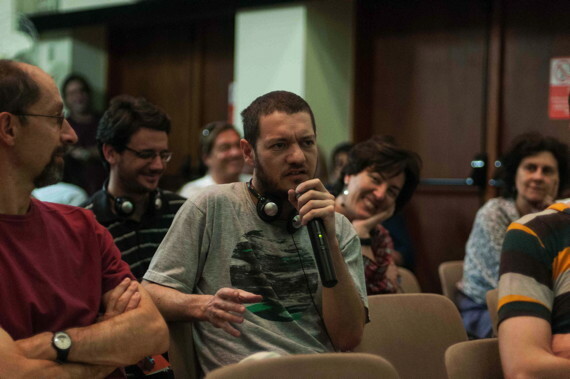 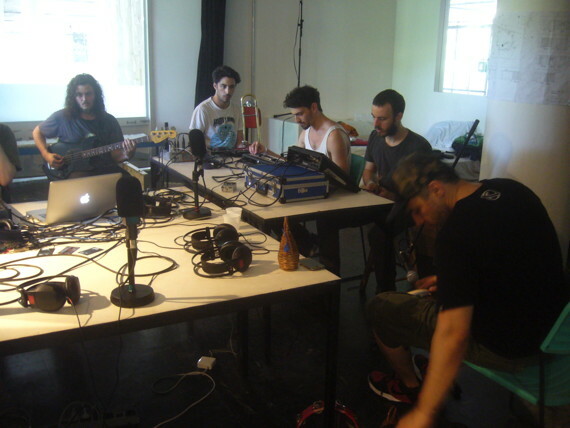 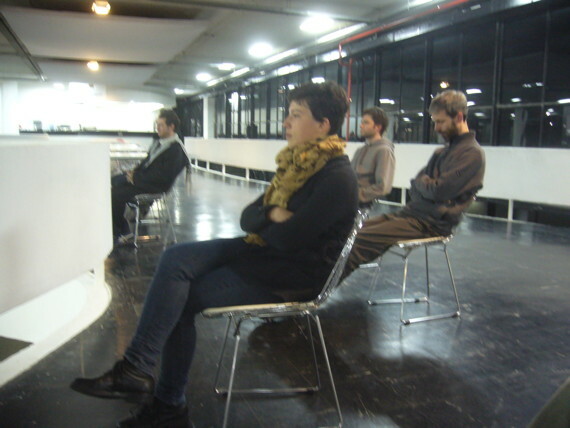 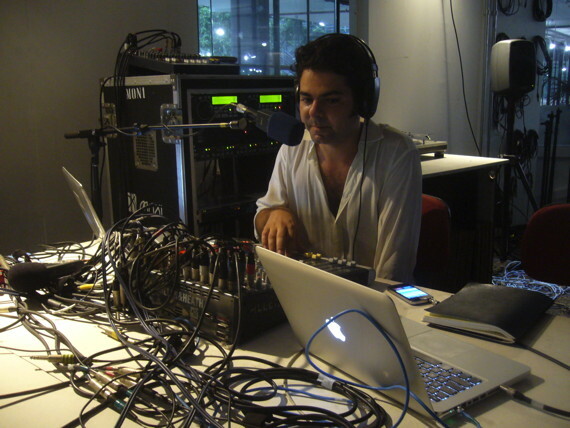 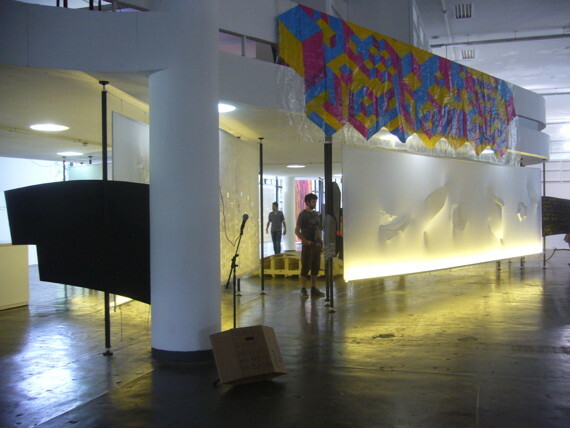 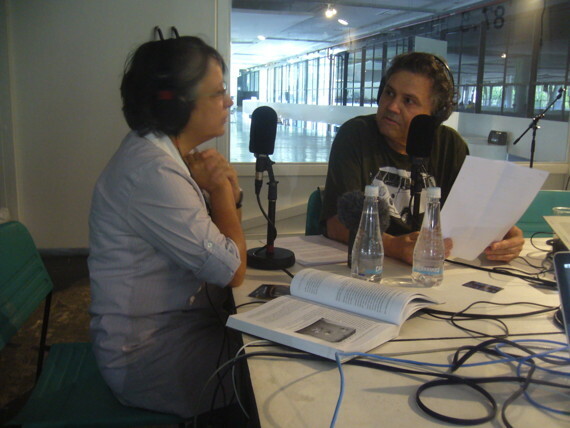 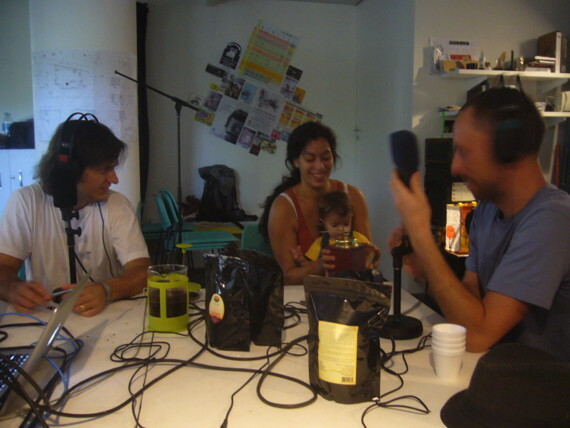 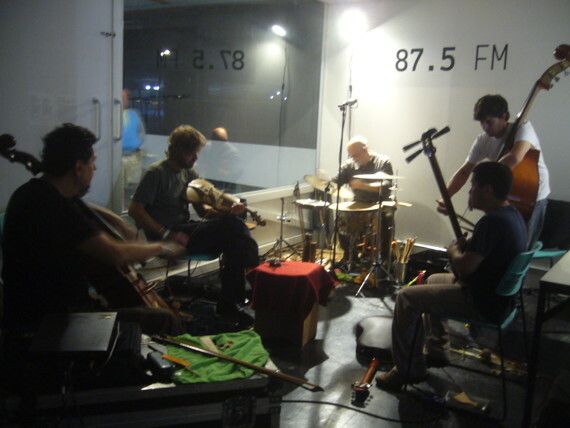 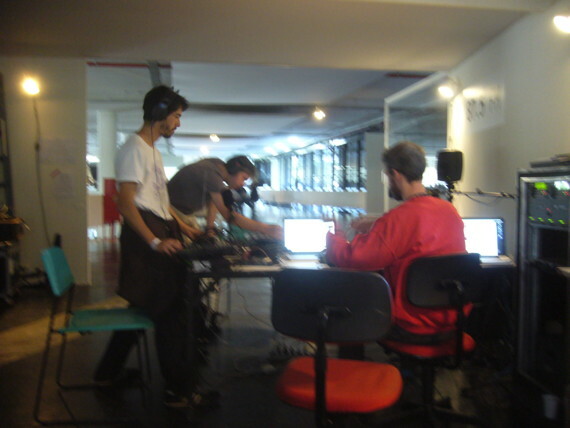 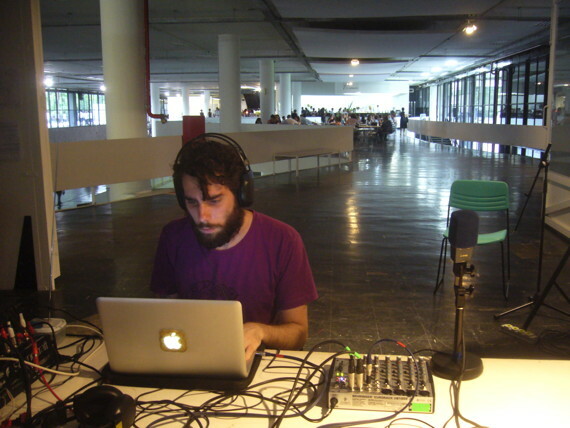 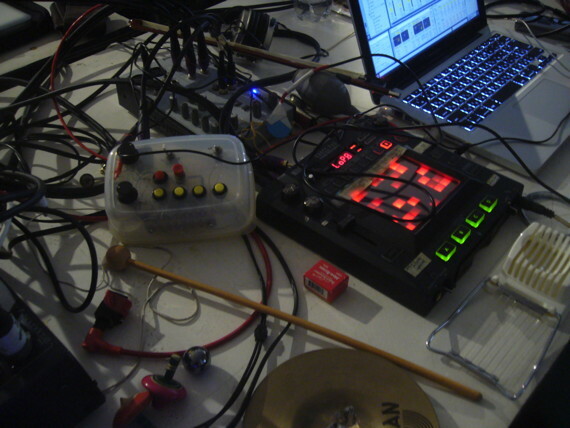 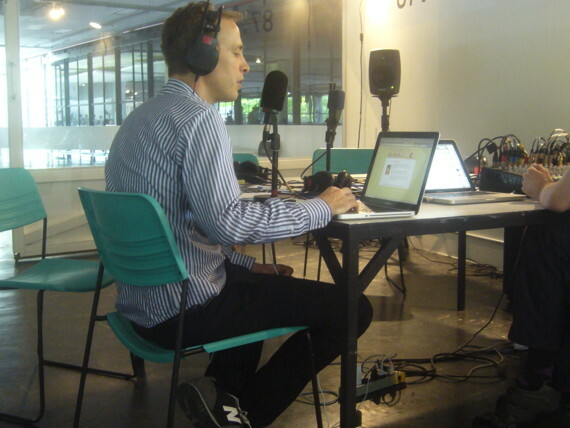 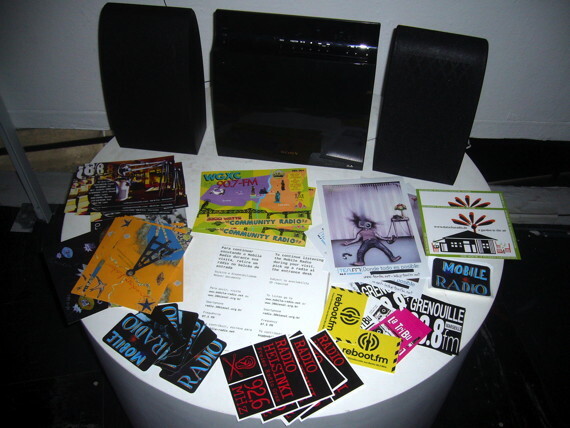 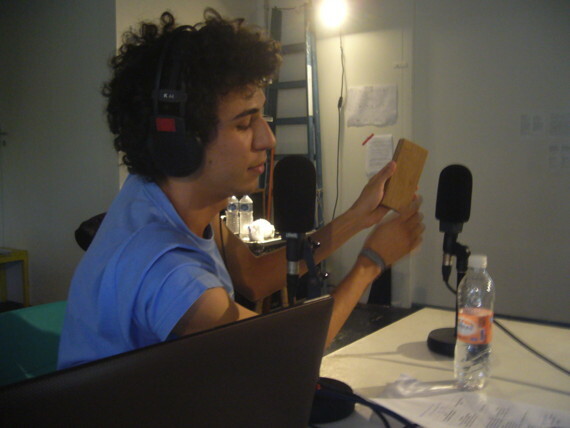 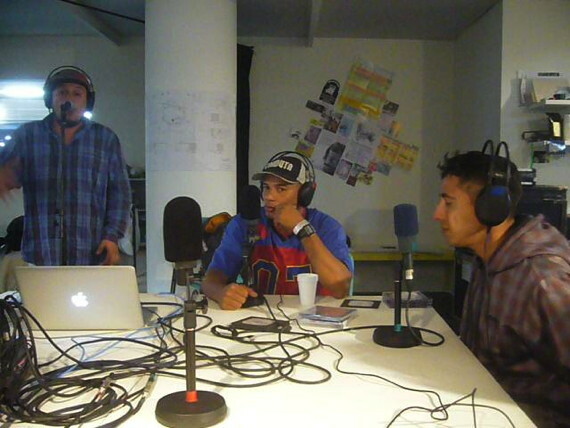 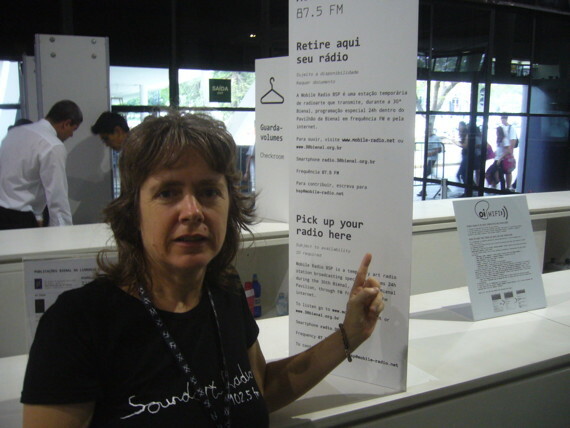 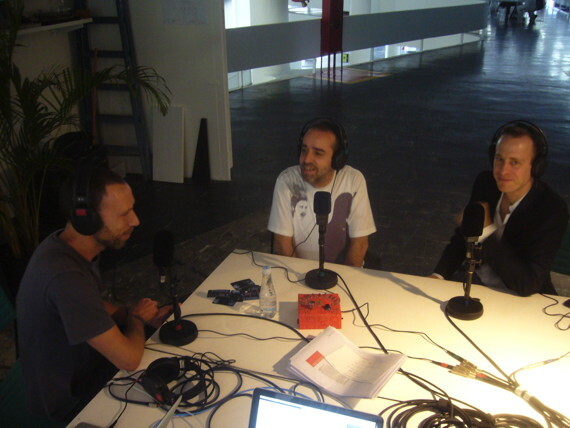 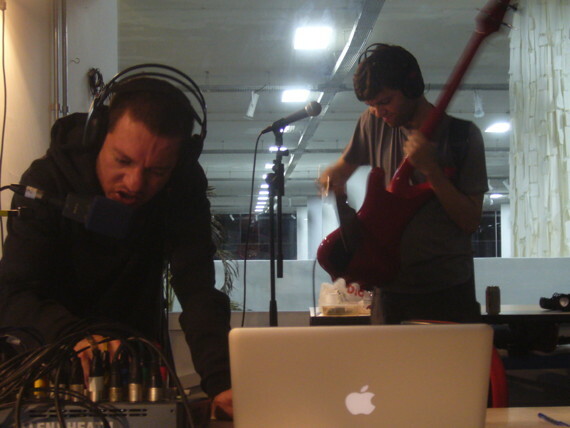 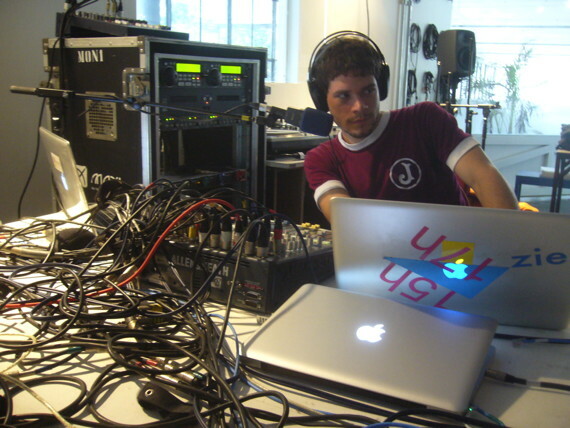 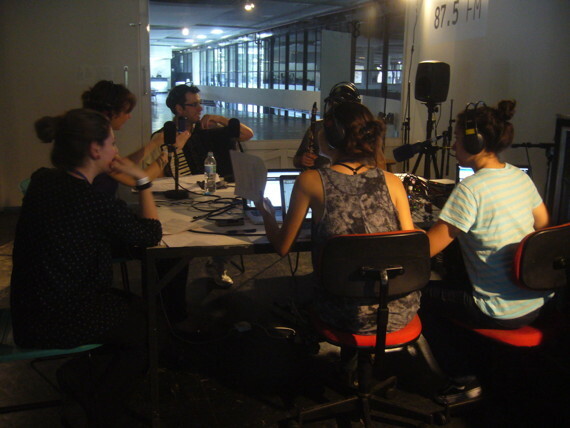 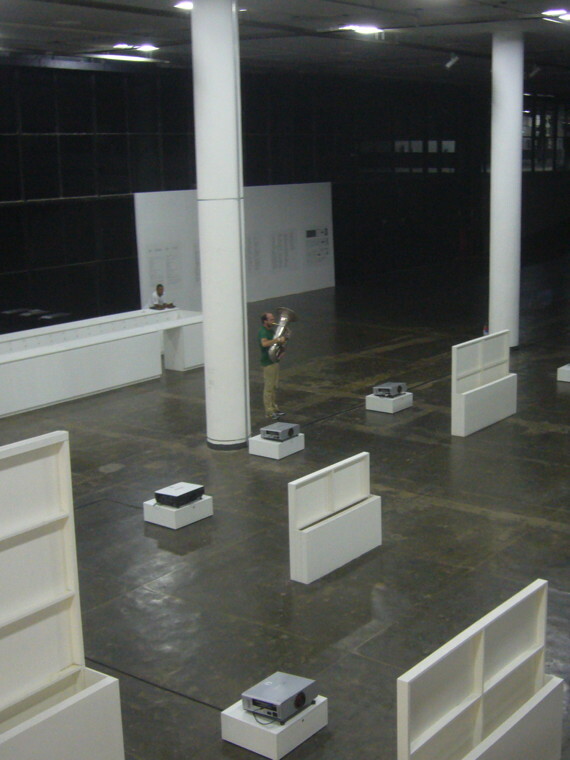 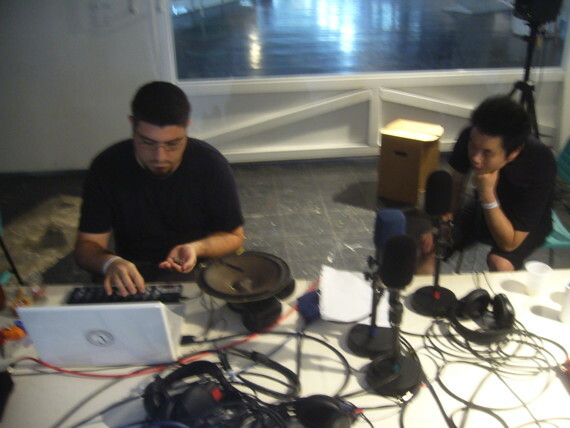 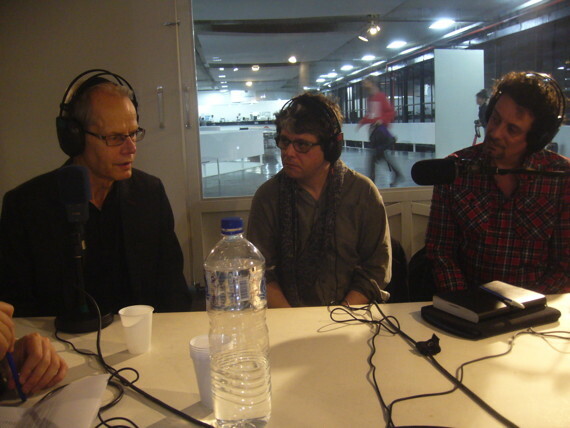 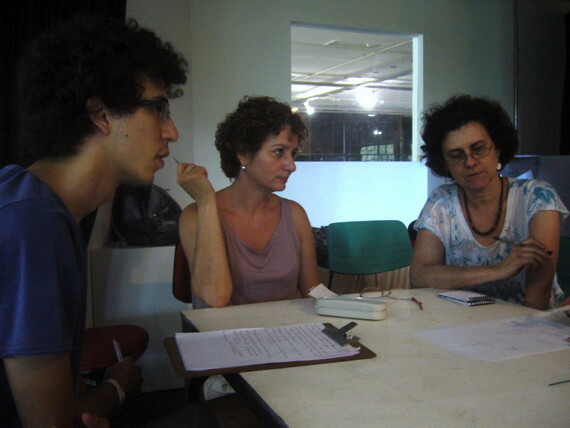 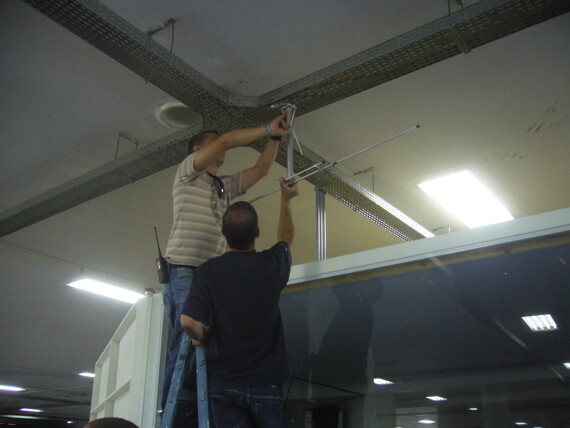 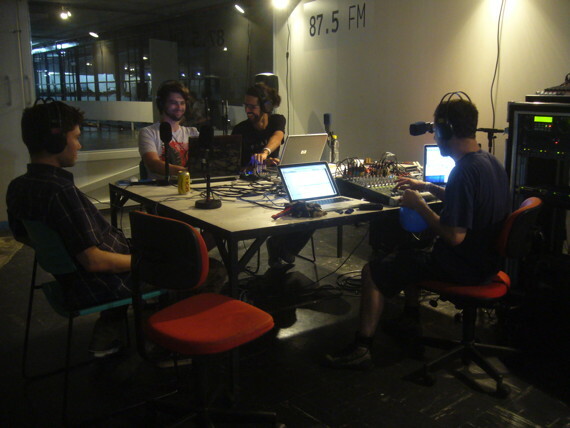 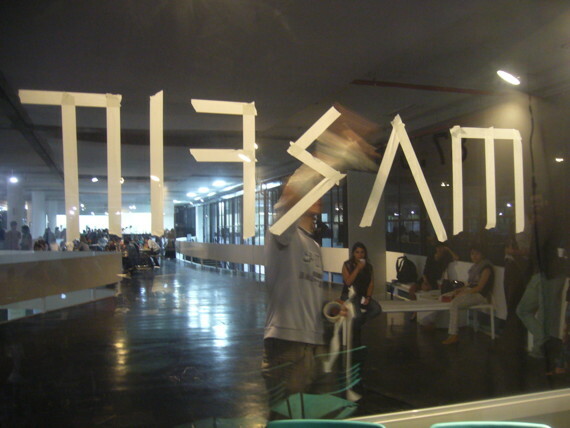 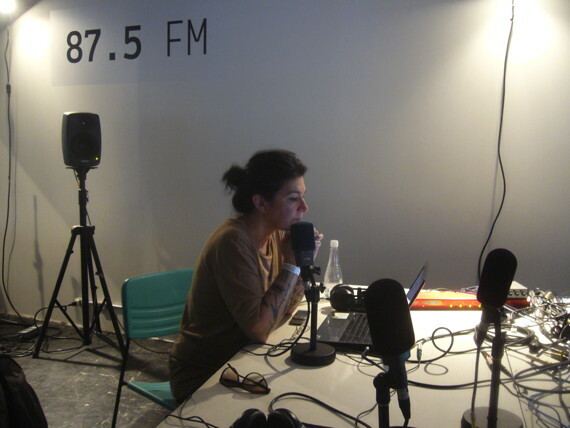 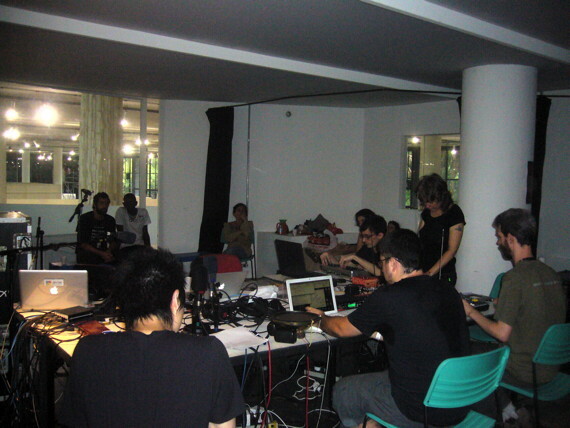 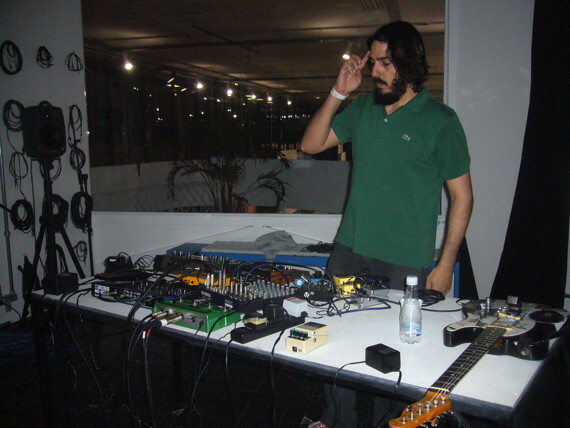 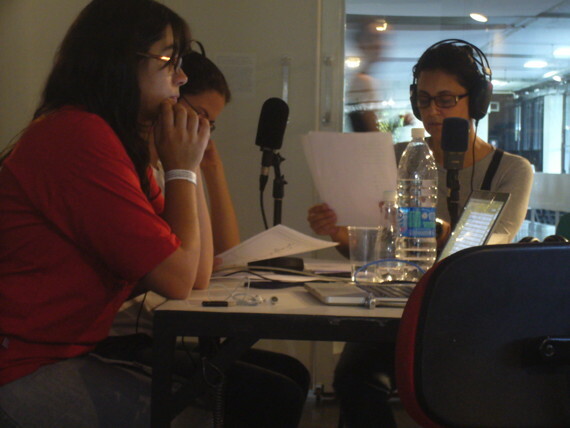 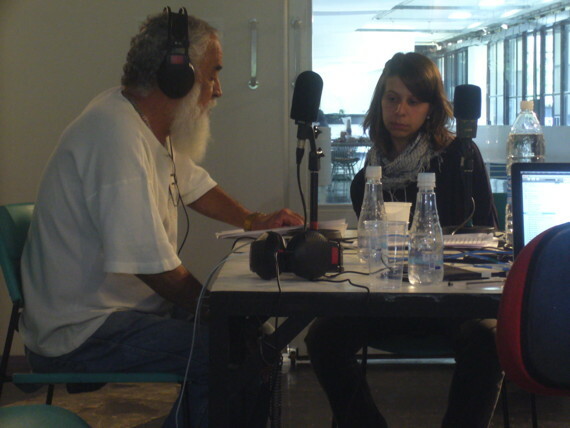 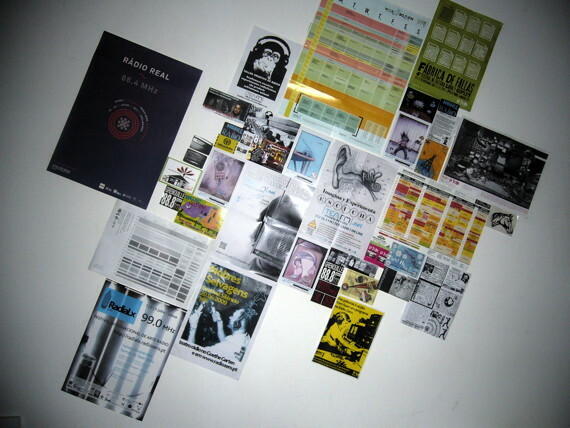 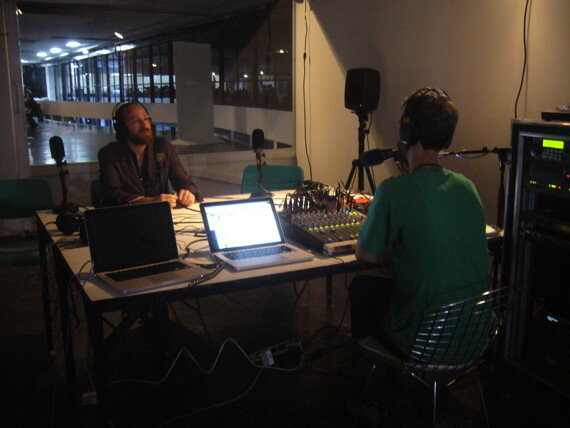 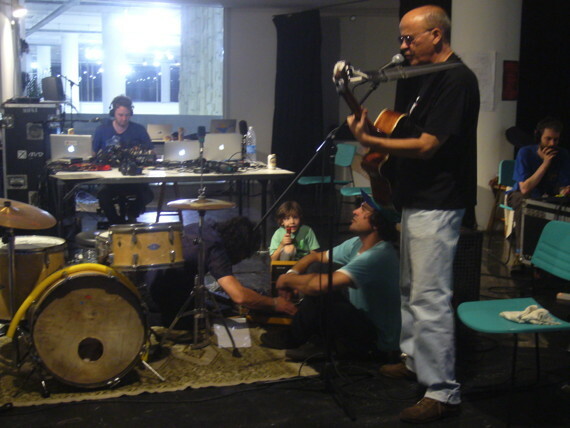 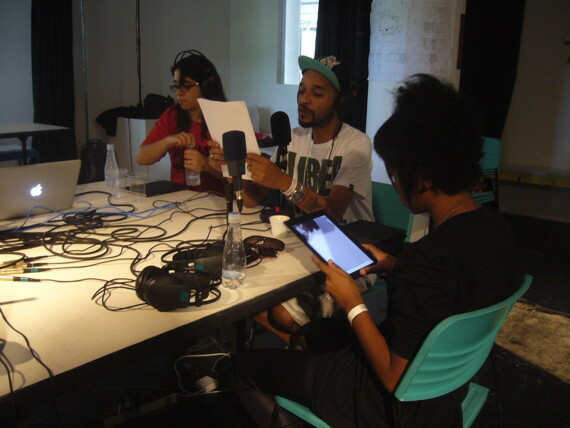 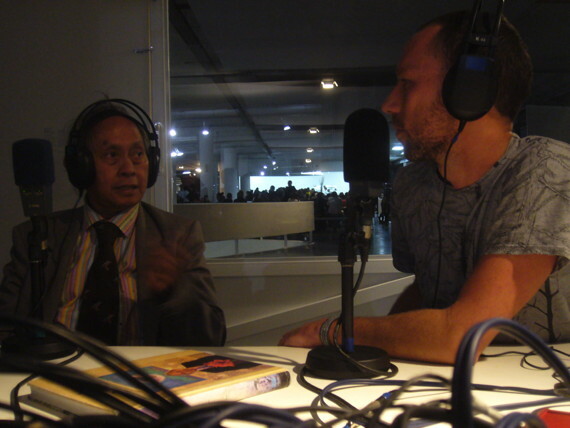 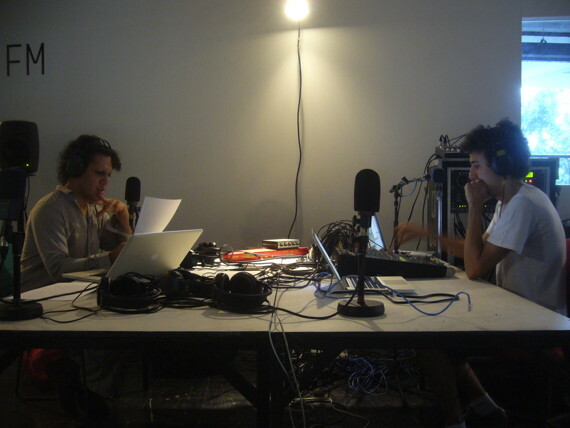 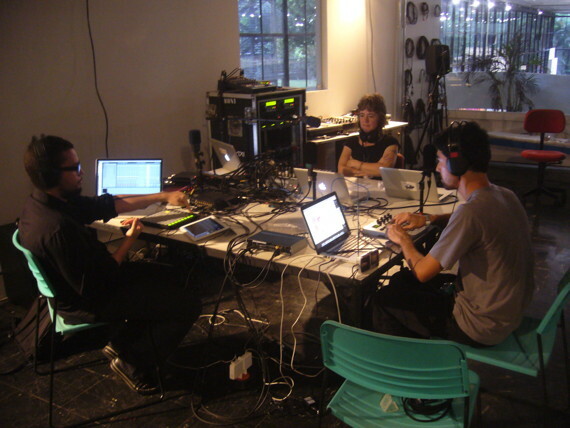 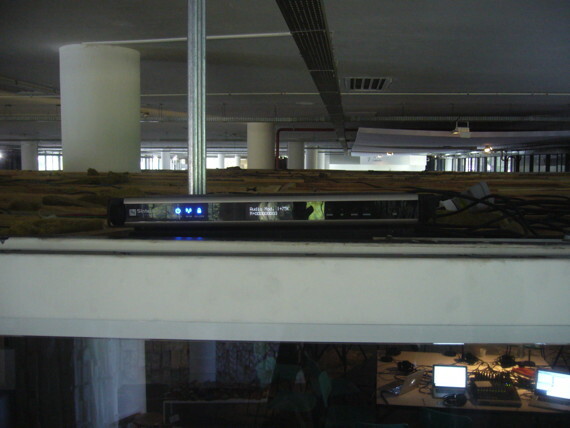 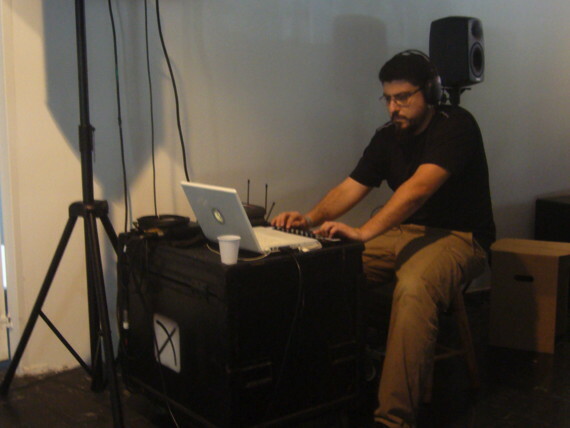 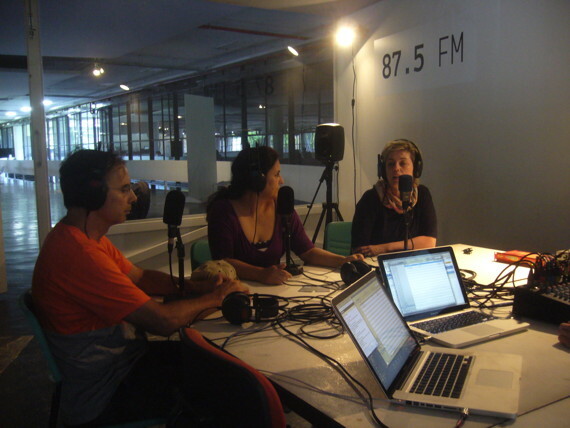 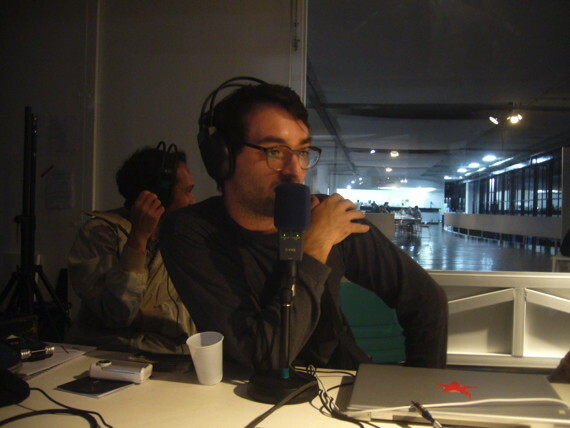 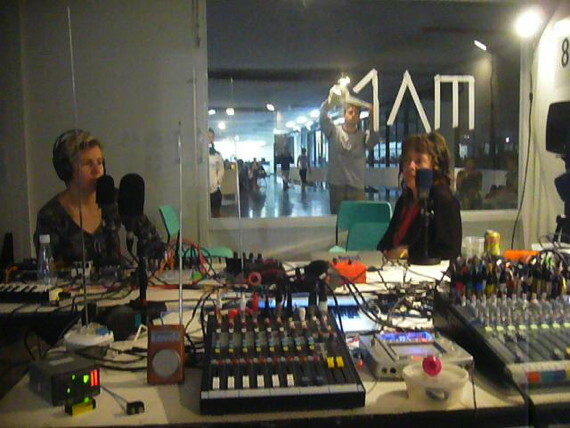 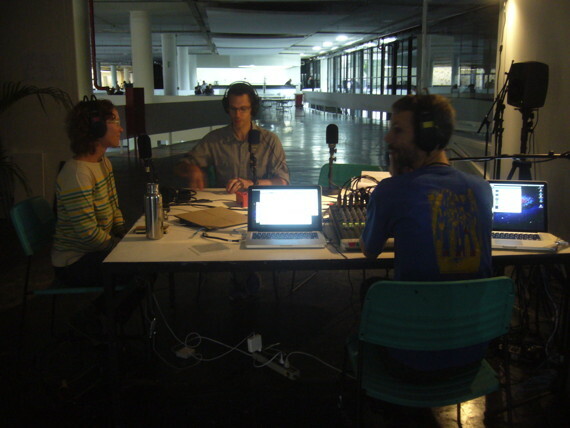 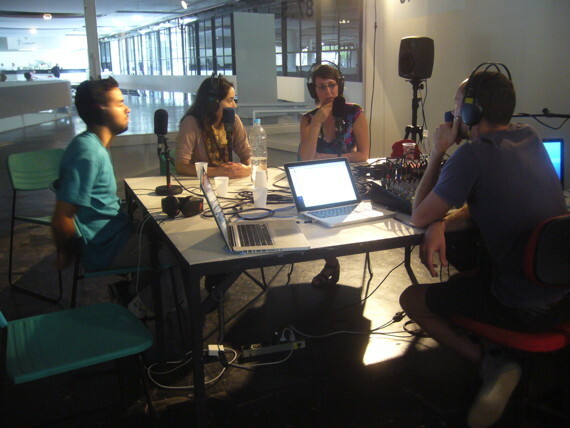 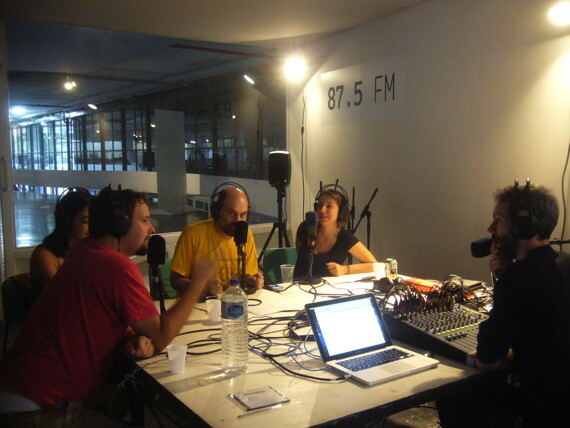 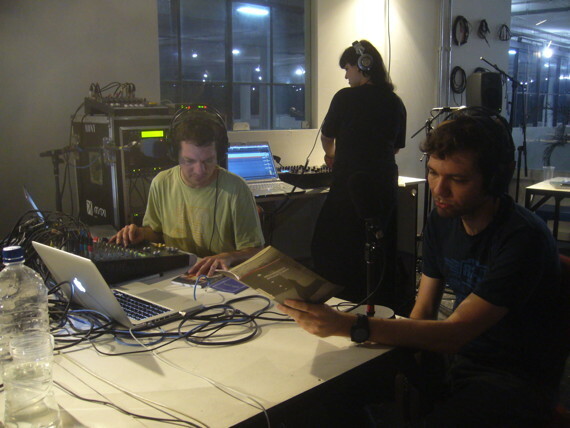 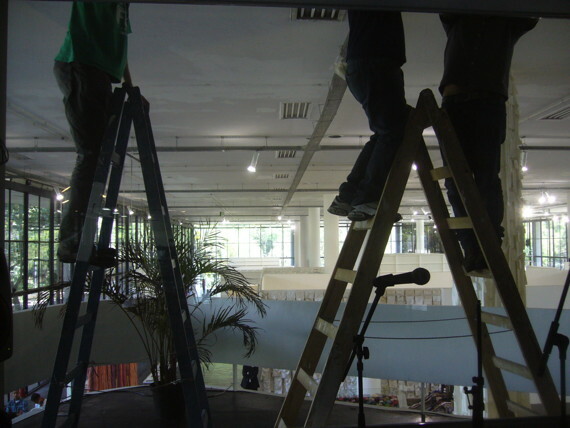 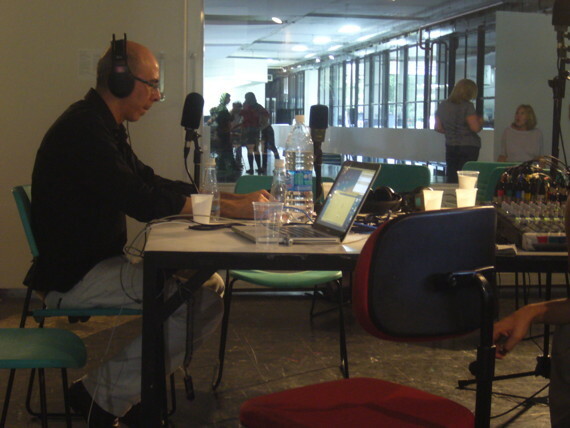 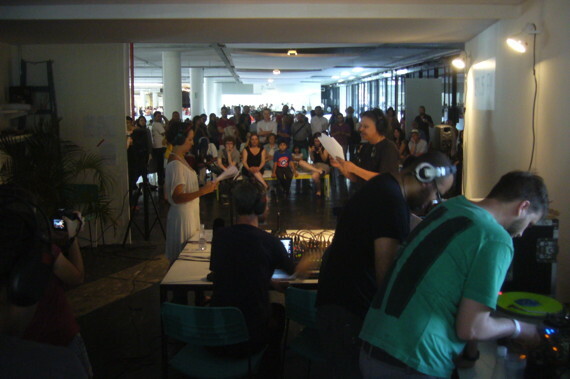 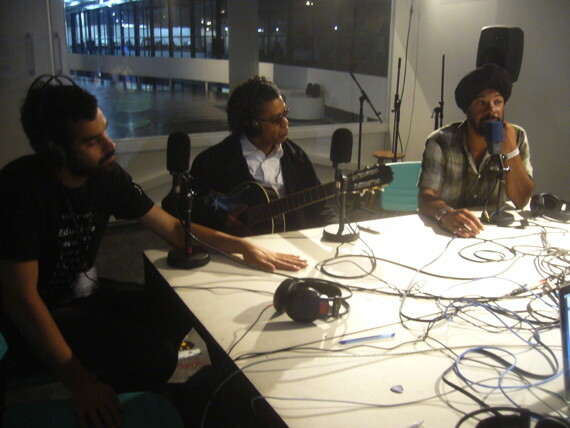 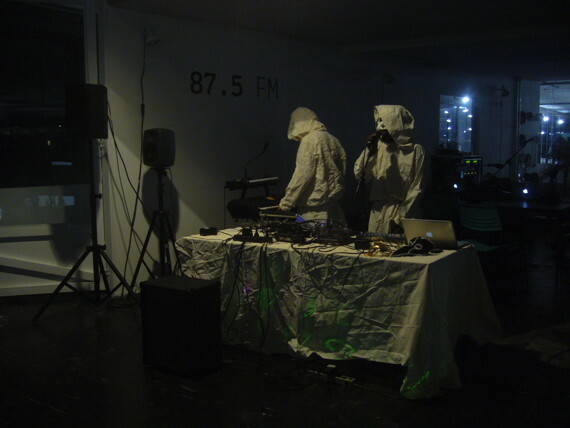 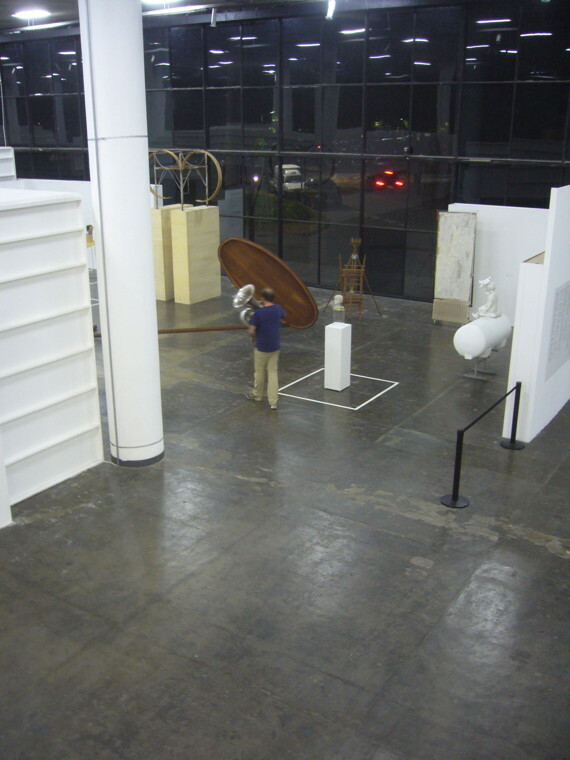 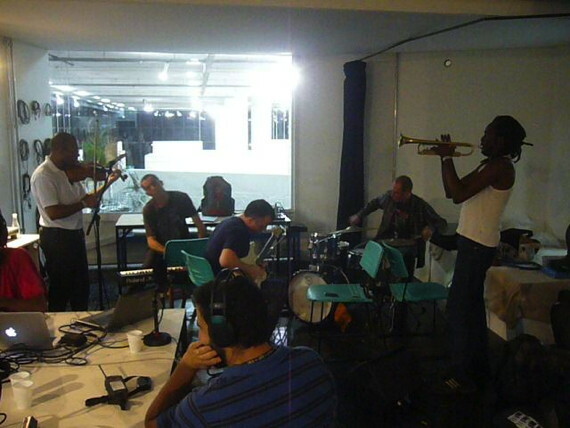 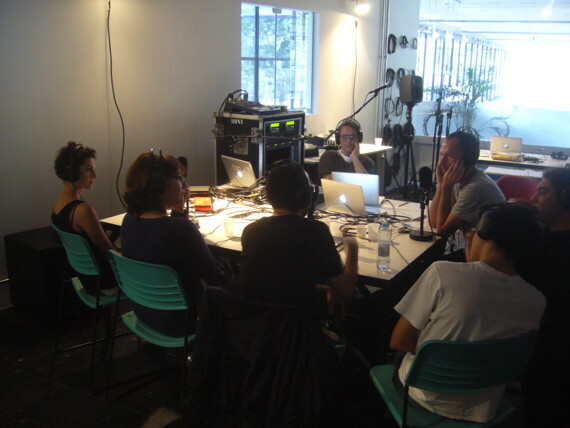 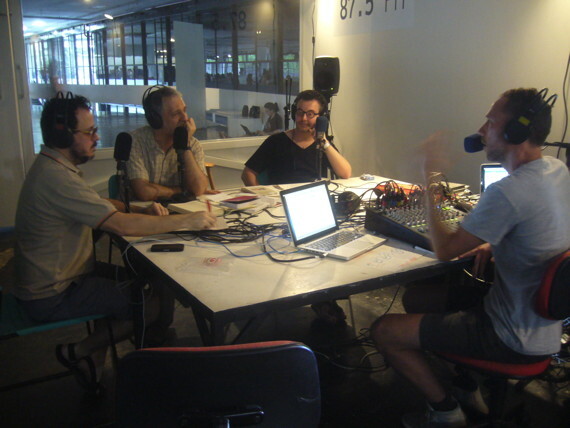 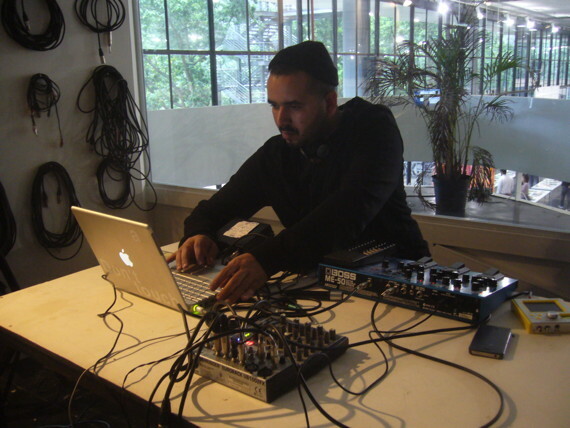 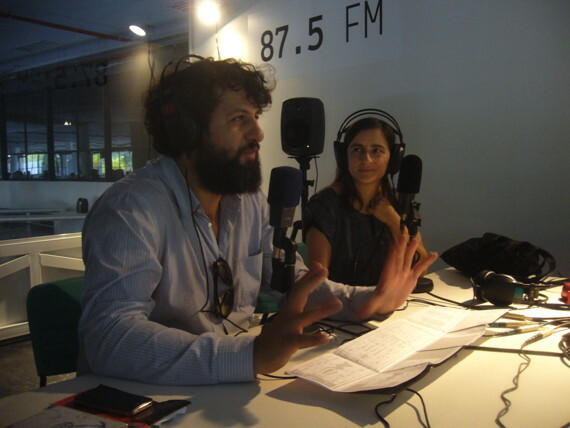 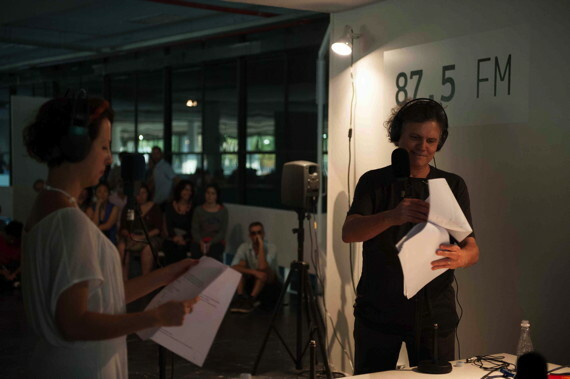 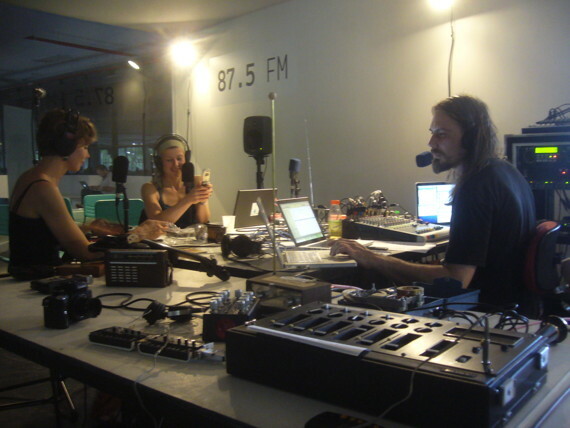 Mobile Radio BSP was the name we chose for our experimental radio station for the 30th São Paulo Bienal in Brazil. 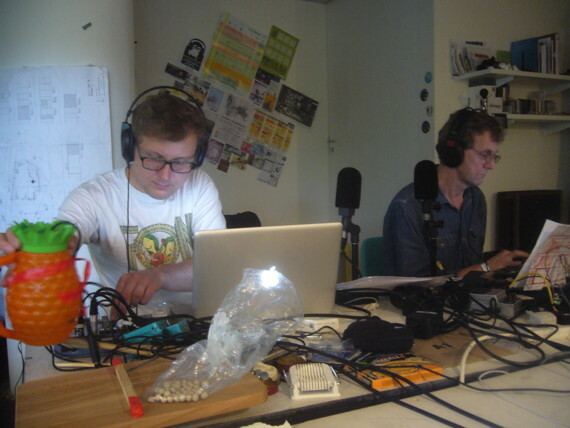 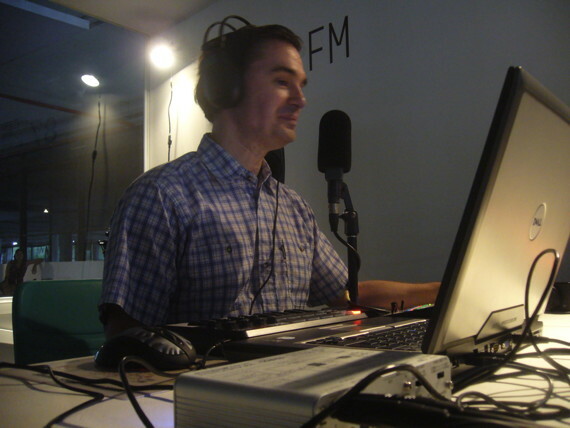 14 weeks of solid broadcasting from the 3rd September – 9th December was the challenge we had set ourselves. 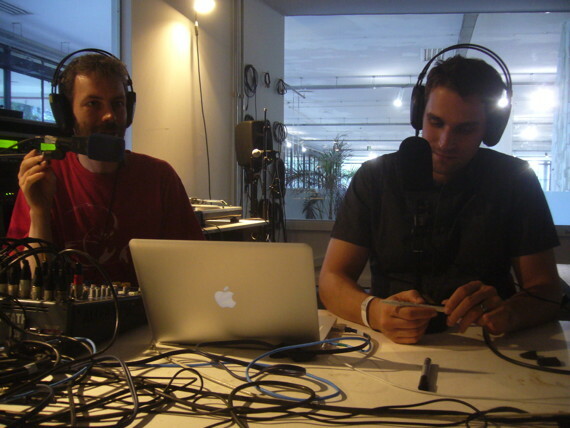 With as much live content as possible and no repeats. 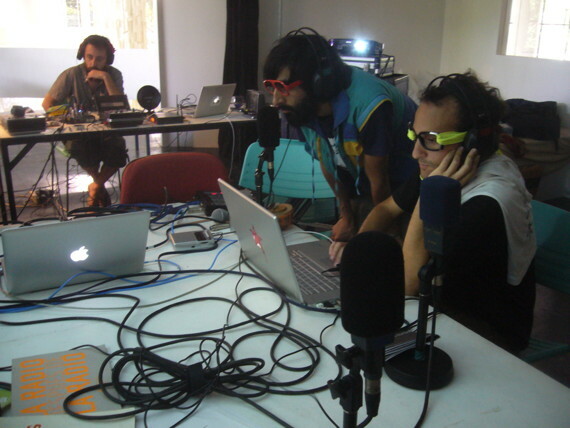 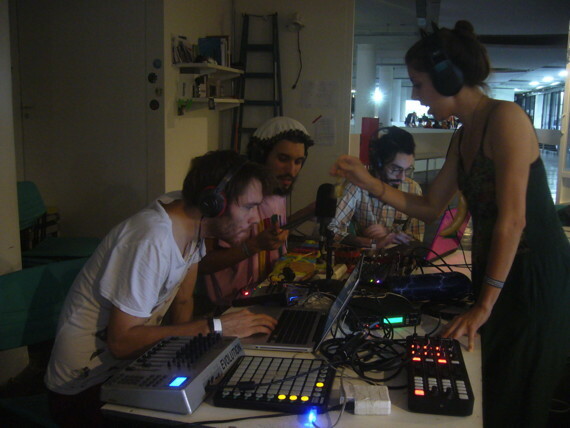 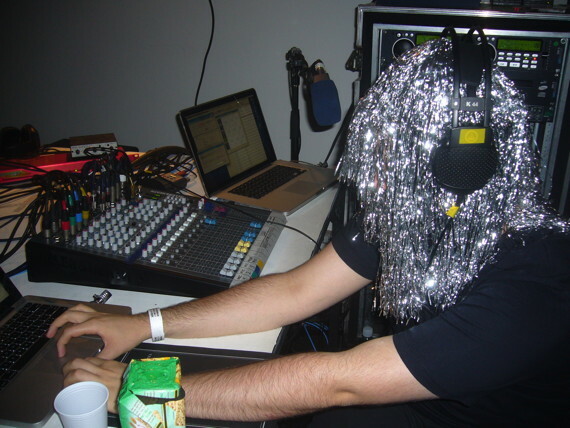 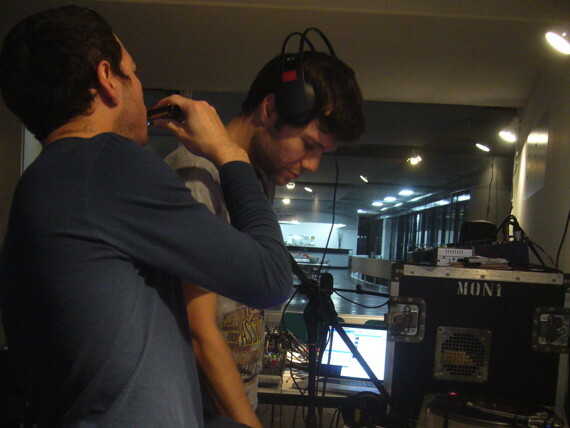 We were hoping that a metropolis like São Paulo would provide ample talent to fill the airwaves. 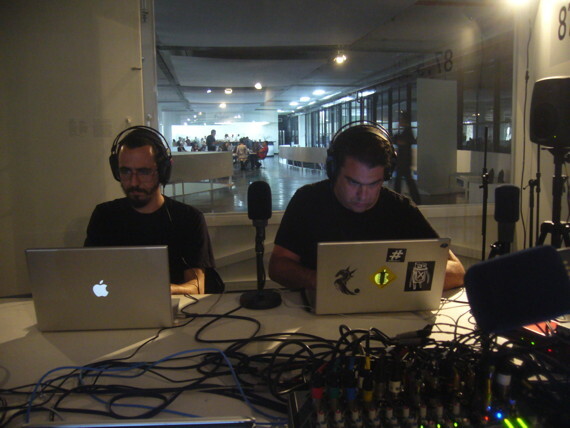 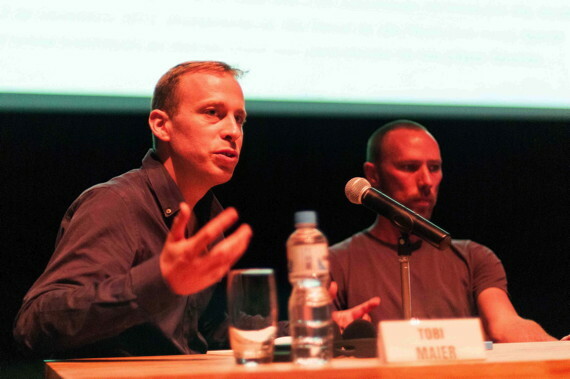 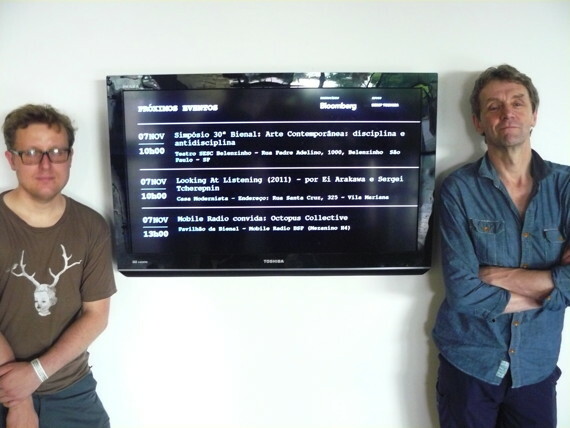 Thanks to our curator Tobi Maier we were able to present our project at the Goethe-Institut São Paulo together with our local colaborator Leandro Nerefuh two weeks before we went on air. 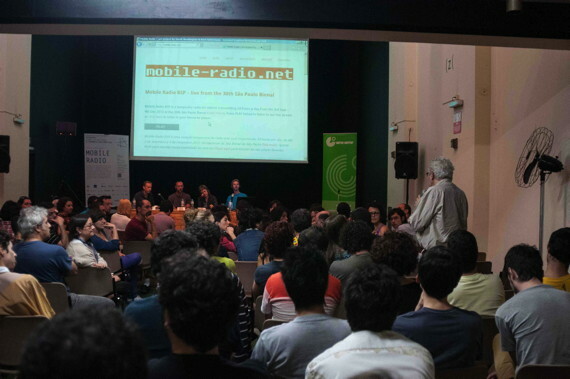 More than 100 guests attended, listened and laughed at our ideas and offered their own during the following discussion and reception. 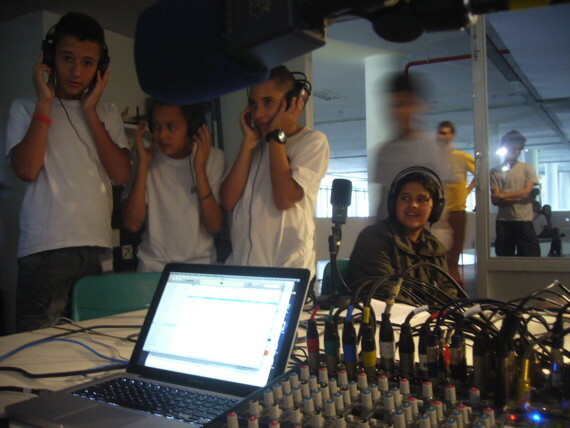 Many of them became regular programme makers for Mobile Radio BSP. 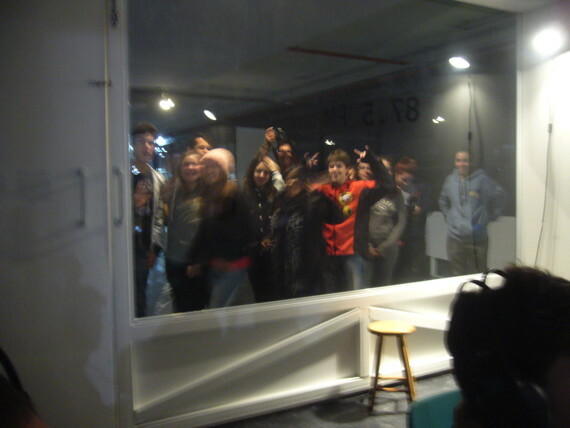 We were quite overwhelmed by the level of interest. 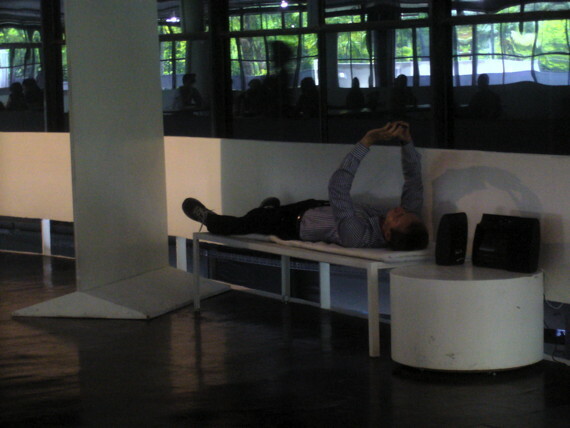 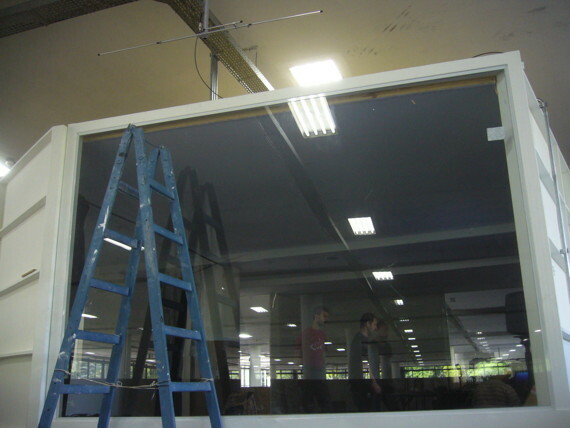 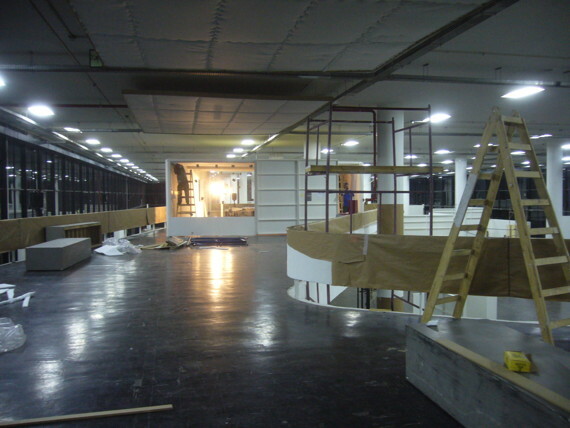 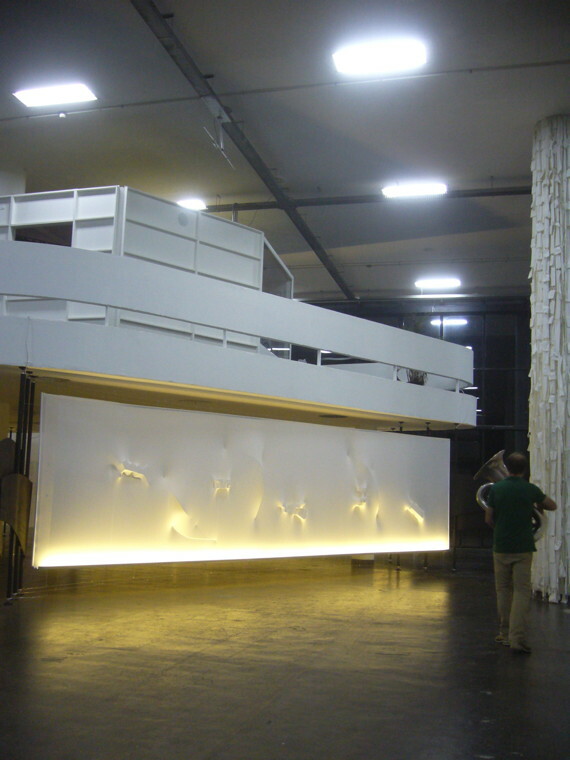 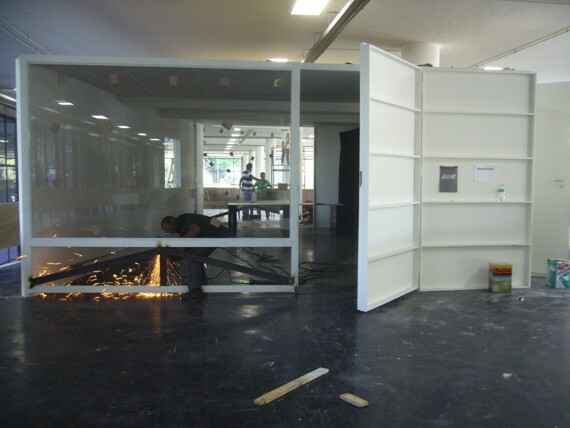 Meanwhile our studio in the Bienal pavillion took shape to our specifications, with two large glass sides which could be fully opened, and a double bed to grab a nap or rest during the long working hours. 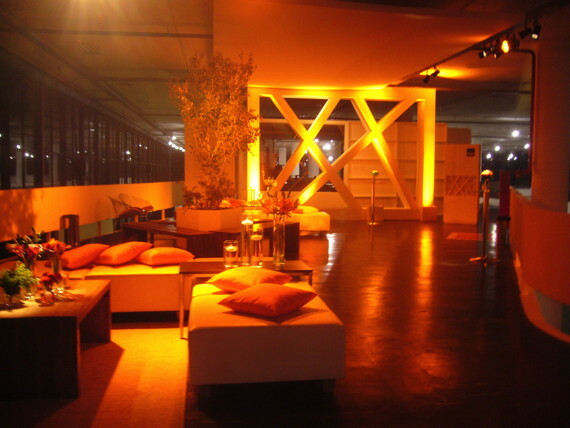 The furniture had to be aquired surreptitiously from elsewhere in the building. 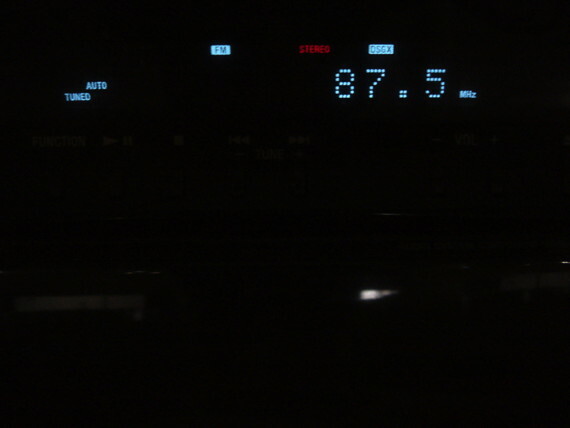 A stopgap low power FM transmitter (while we waitied for the proper one to be built) and antenna arrived just in time, but the broadcast licence was still missing. 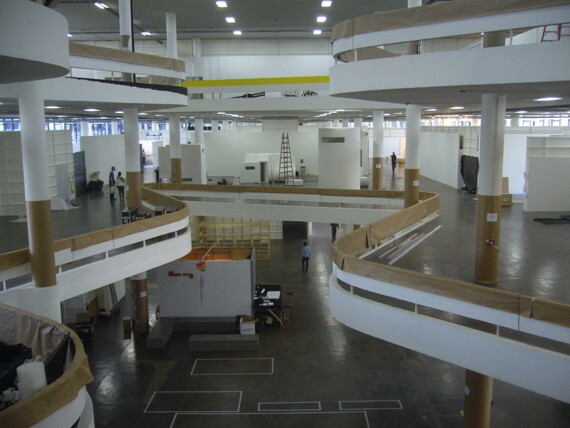 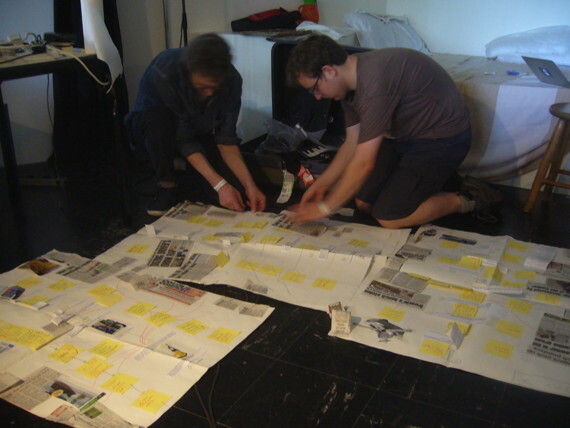 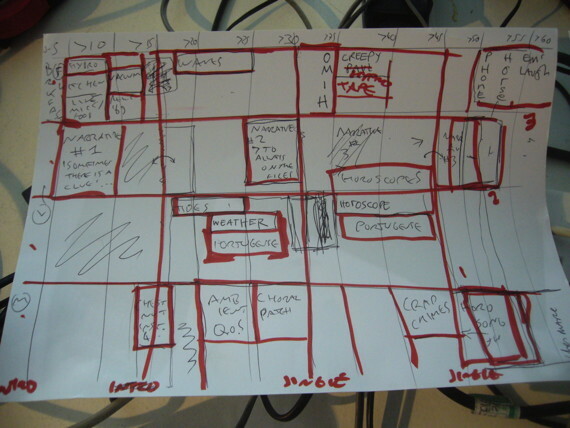 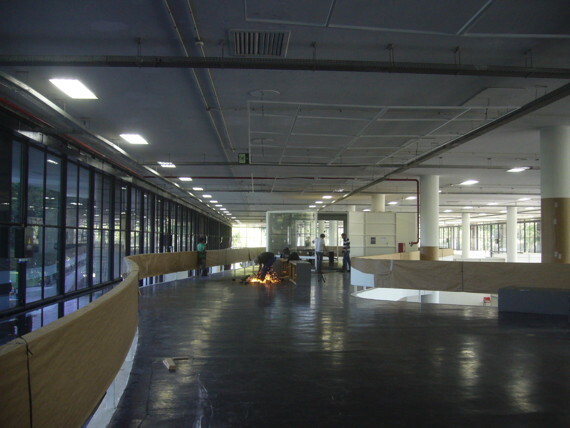 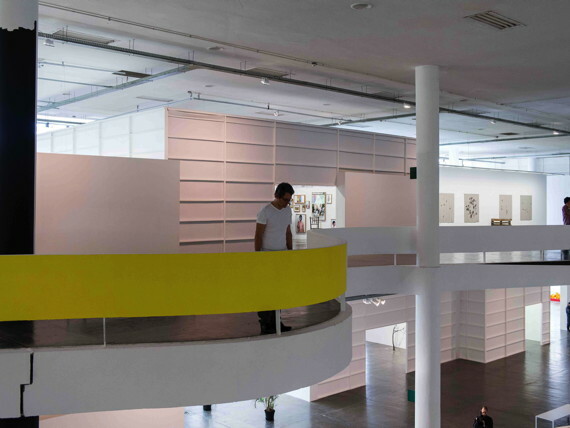 The lateness of these crucial project elements and the missing finishing touches to enable us to provide for the comfort of Bienal visitors caused unnecessary friction. 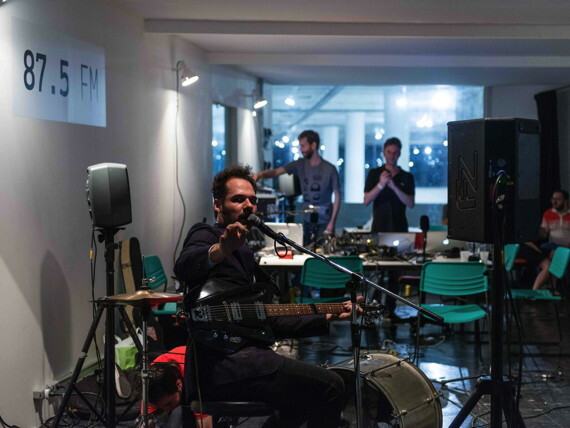 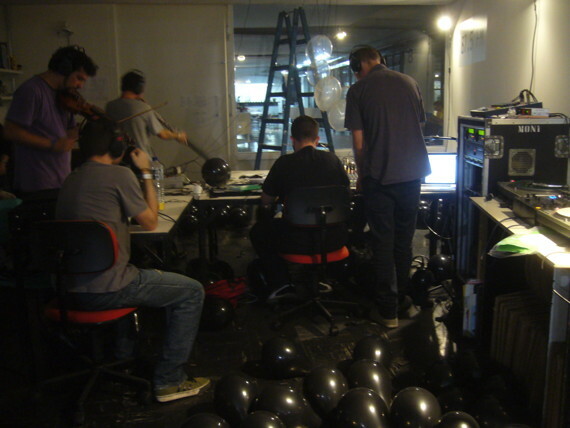 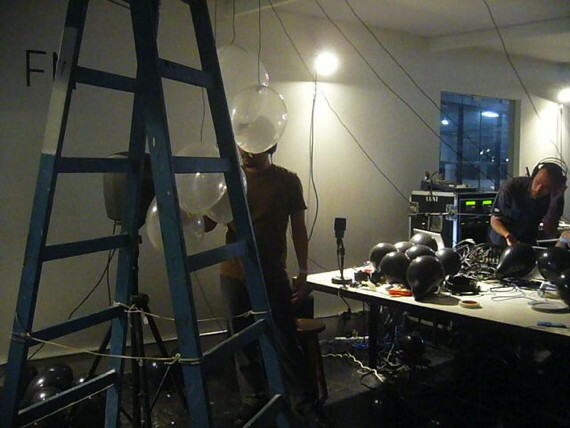 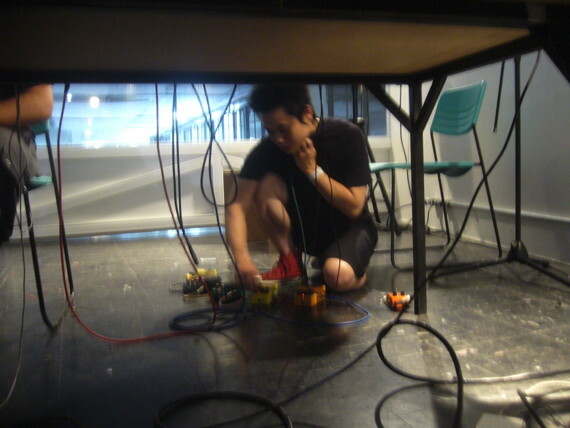 To celebrate the arrival of our FM licence on day two of the exhibition we hooked up with fellow Bienal artist and noise musician Marco Fusinato, and as we also needed to let off some steam we tested the protection circuits of our studio speakers. 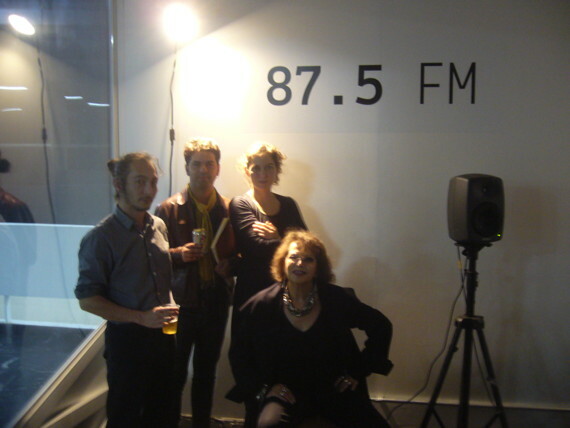 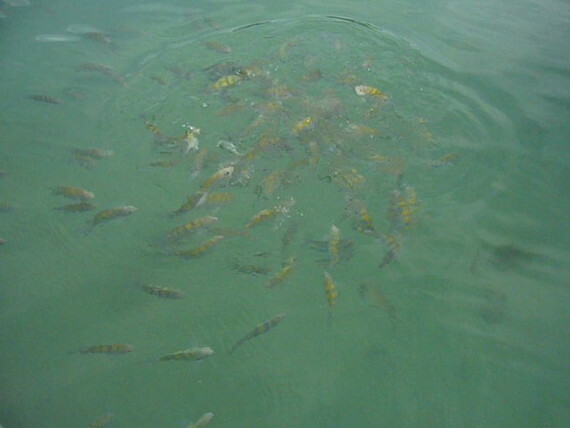 The highlight of the first week happened on the public opening day, September 7th 2012. 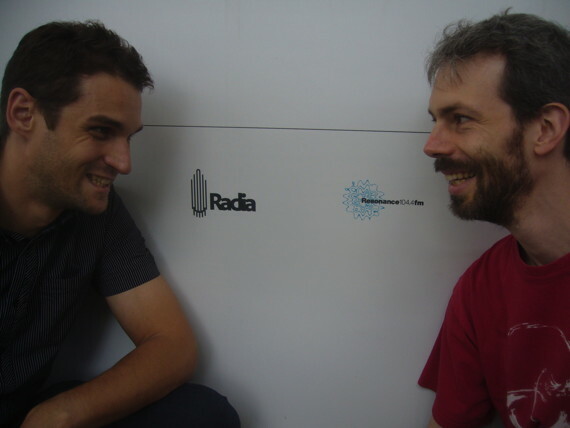 We wanted to mark the 90th anniversary of the first radio broadcast in Brazil. 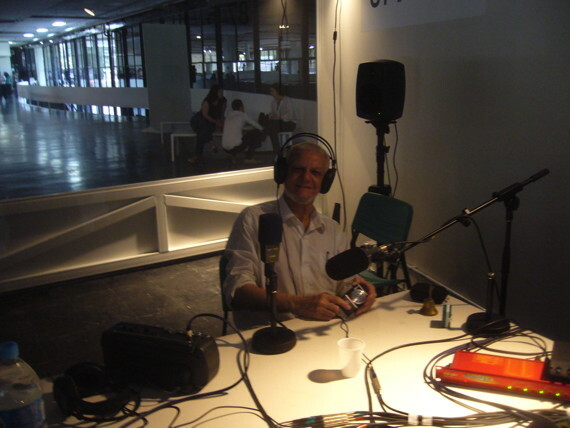 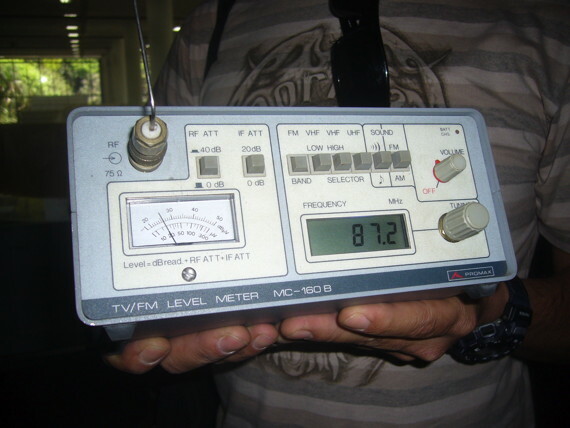 Happily, Brazilian national radio producer Julio de Paula wrote a radio drama based on the story of Edgard Roquette Pinto, the scientist and educator behind this first transmission. 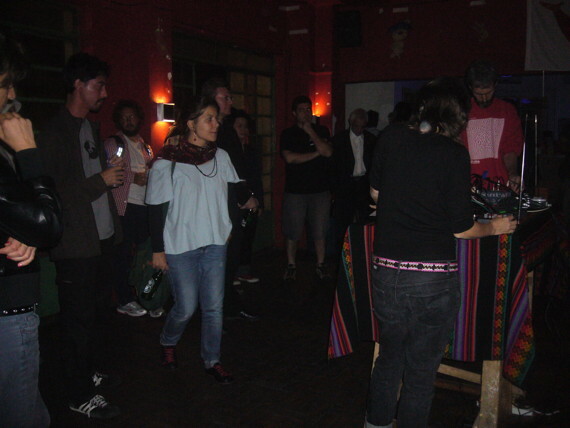 Edgard’s granddaughter was in attendence to witness the spectacle that featured an opera singer and an actor, live amateur radio signals, sound effects, plunderphonic DJs, live sound processing and a script by Julio (listen). 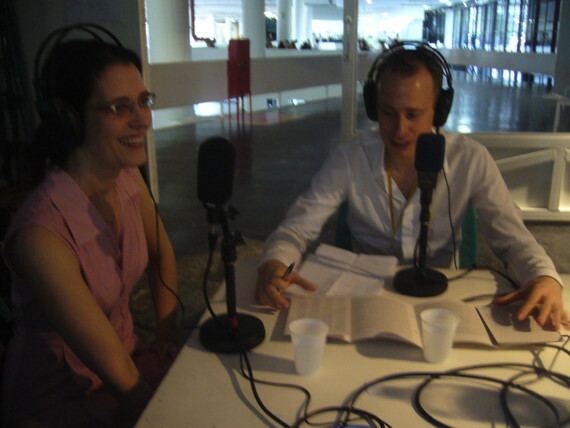 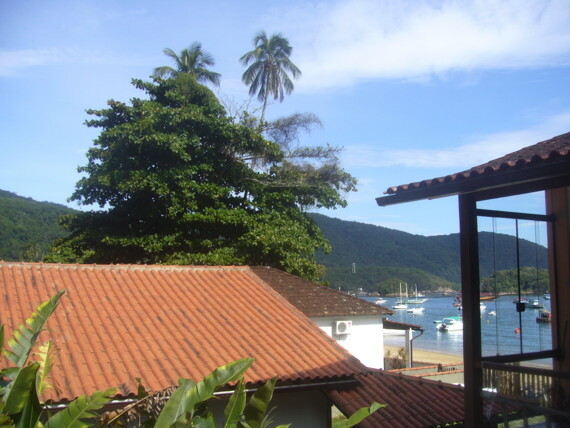 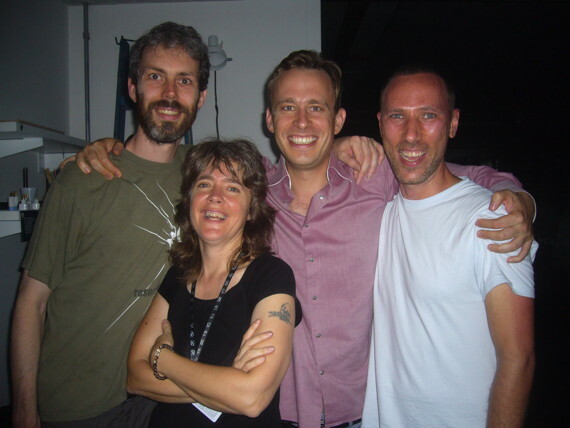 Unbeknown to us until it was all over, during the piece we were handed responsibility for the future of radio in Brazil. 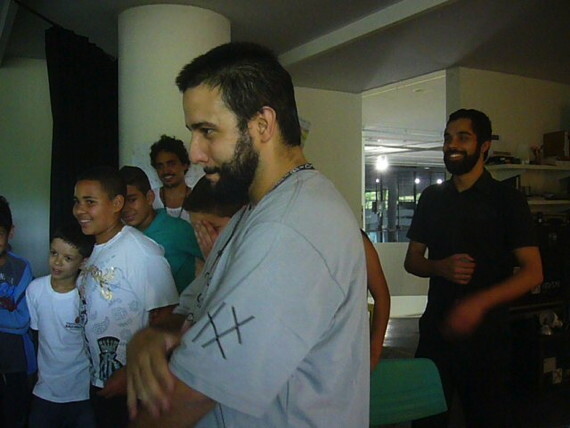 It was very humbling.